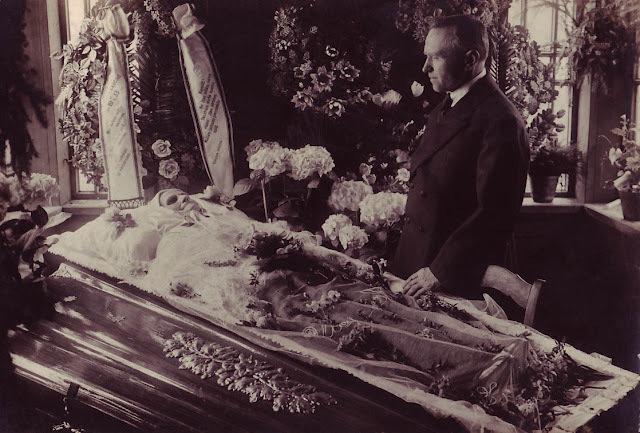 Many postmortem photographs were close-ups of the face or shots of the full body. 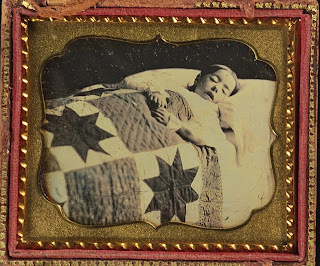 The deceased were usually depicted to appear as if they were in a deep sleep, or else arranged to appear more life-like. 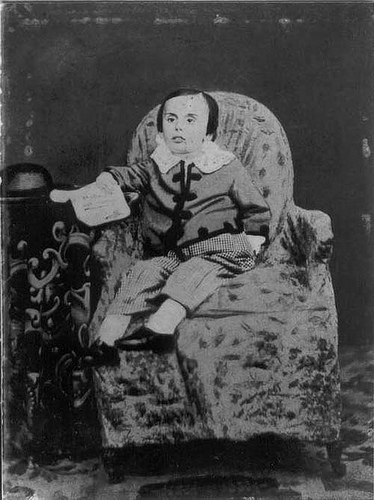 Children were often shown on a couch or in a crib, often posed with a favorite toy. 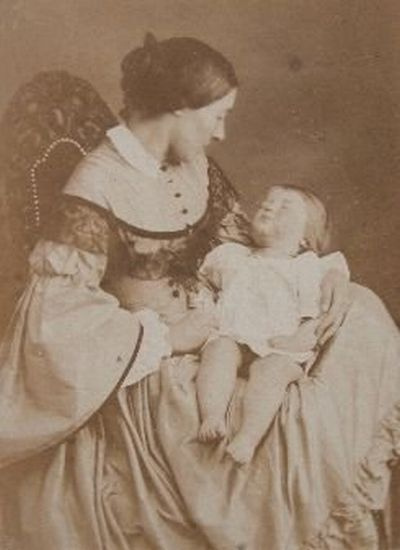 It was not uncommon to photograph very young children with a family member, most frequently the mother. 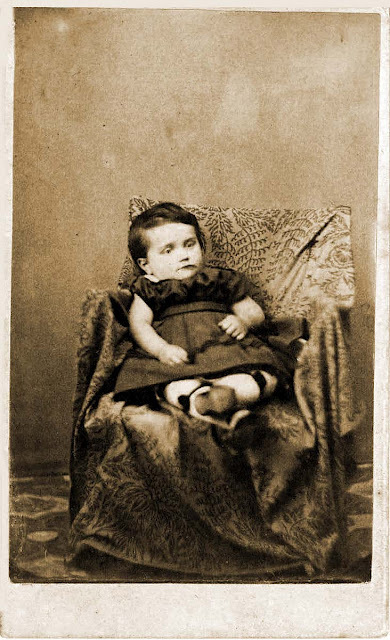 Adults were more commonly posed in chairs or even propped up on something. some of them I dont think are post mortem. To pose the loved ones sitting in a chair with a book in their lap is beyond words for me. 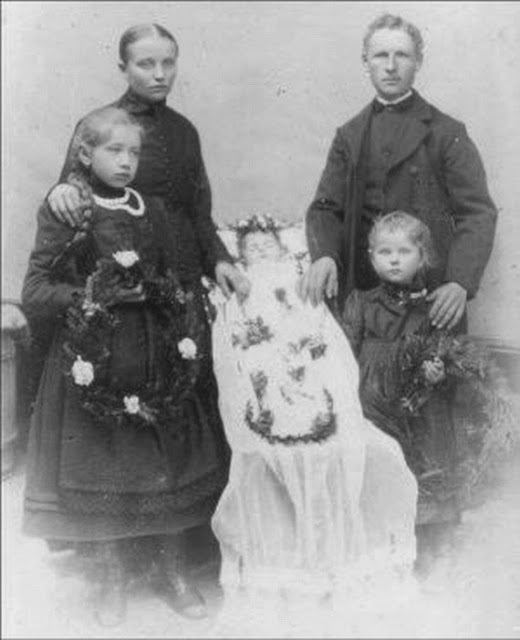 And to see the siblings standing next to their dead brother/sister posed as if they are not dead is horrifying. You can see it in the children's eyes how it is effecting them being made to go through this. 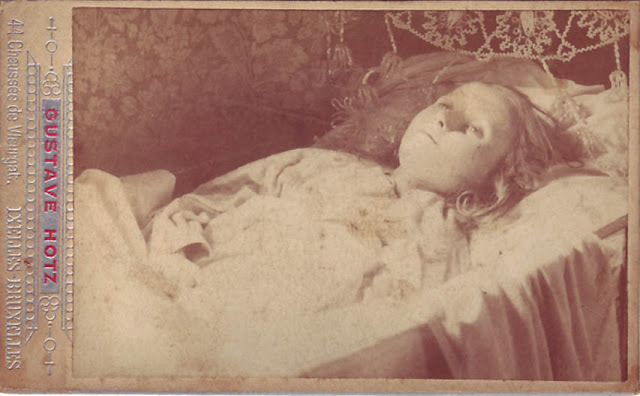 Keeping the deceased eyes open and posed as if they are alive in their last picture is so wrong at many levels. What a horrible era to of lived. To them they didn't know of anything else and this was the norm. Ugh! I think its beautiful and a great commemoration of life. When you have lost a child your heart aches forever. Then down the track panic sets in memories die what did there face look like what colour was their hair.Then distress feeling that you have let them down by forgetting certain thing's about them. When a person dies now everyone has pictures. 19 years ago when our in utro baby daughter died. That was that. When our baby granddaughter died at 8 months our son and daughter in law were asked if they would like a couple of photo's of alyssa of coarse the answer was yes. So to say it is awful or morbid is proof you haven't been in that situation. What I see is pain in the parent's faces the mother's tender touch hoping to see their child respond. 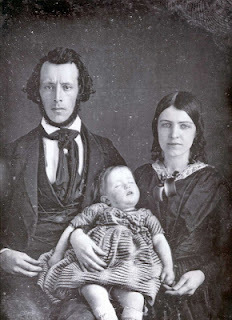 The father trying to soldier on then he tenderly to hope's to see air in his child's lungs. There is no doubt some of these people are alive. Posing stands were used on live people as well as the dead. 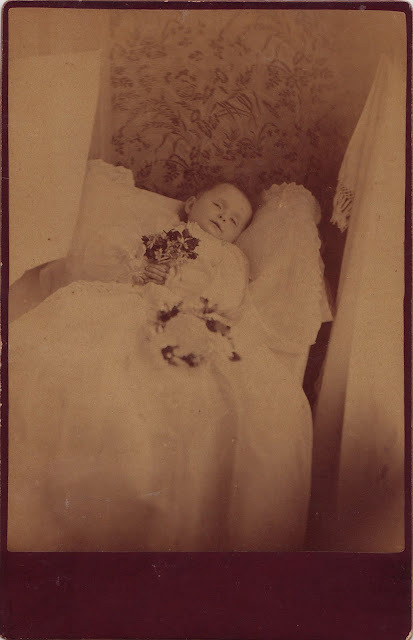 It is a well known fact that the reason the people did post mortem photography was because pictures were expensive and had long exposure times. If u so much as flinched it would ruin an already expensive photo. 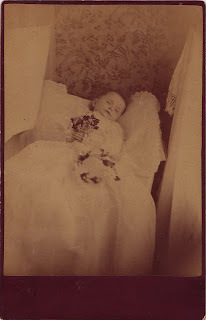 There is nothing morbid or wrong with people capturing the last image they could of a loved one. It is people like whom ever made that comment that try to make it morbid. It was just common practice. And by the way if u don't like it you didn't have to look at it! 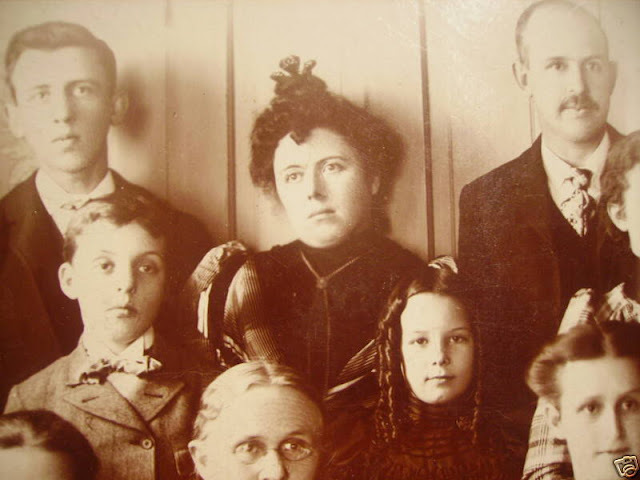 Most likely the only picture ever taken of them for the family to remember that they did exist. No, a good many aren't. Some very obviously aren't. I have a large collection of 19th century photos, and I agree that some of these are NOT clearly post-mortem photos. Don't be fooled by people staring (some had never seen a camera before, and often only one or two shots were taken, not hundreds as may be the case today) or even with their eyes shut. Don't be fooled by swollen or weak-looking eyes, either. This can be a sign of poor vision, other illness, or even allergies. Stiff posture could be tight corseting. And, of course, it's common to see the bracket that held your head still; photos took a while to take, so the bracket helped hold the subject's head still. That's also possibly a reason why people so rarely smiled in early photos. Oh, and the color blue looks white in some early photos, so people with blue eyes sometimes look a little strange. 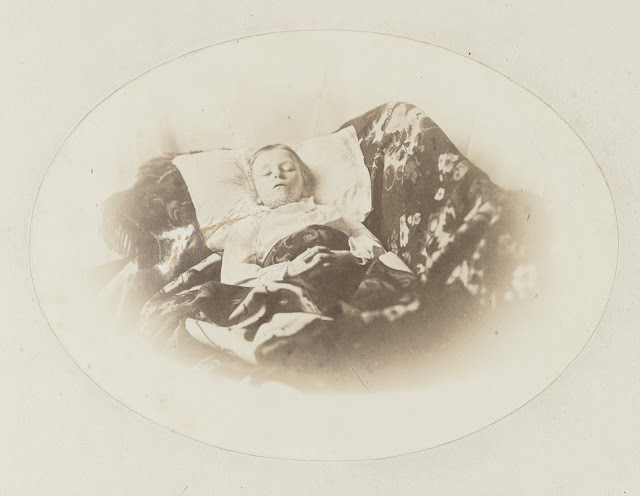 True post-mortem photos can be rather expensive and hard to find and there's no doubt that the subject is deceased. I certainly wouldn't pay lots of money for ANYTHING that I wasn't SURE about. 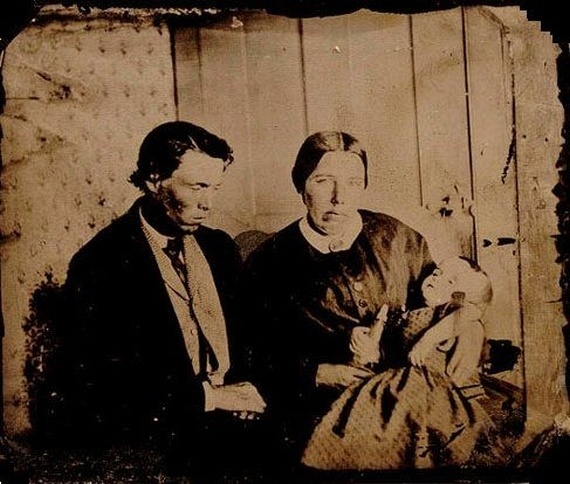 If a person isn't used to looking at 19th century photos, he/she might be conned by a cagey dealer into spending a LOT more money than the photo is worth. You are all such experts. The Fireman is dead. 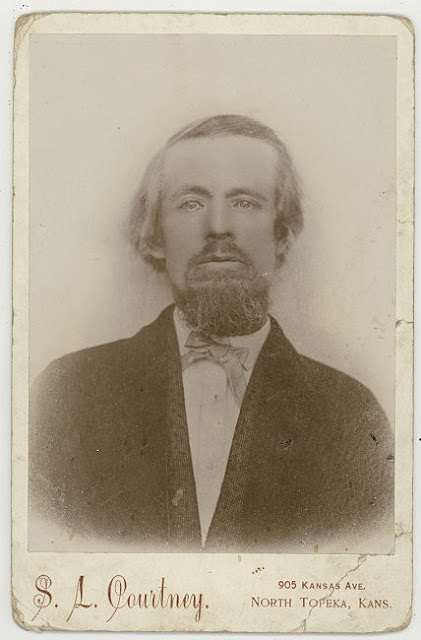 There are many close-up pictures of his face available in archives. 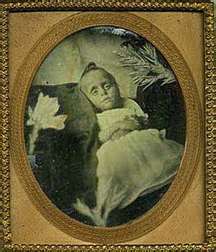 As for the eyes, the deceased eyes were not held open. The photographer etched in the eyes after the pose was conpleted in most cases. 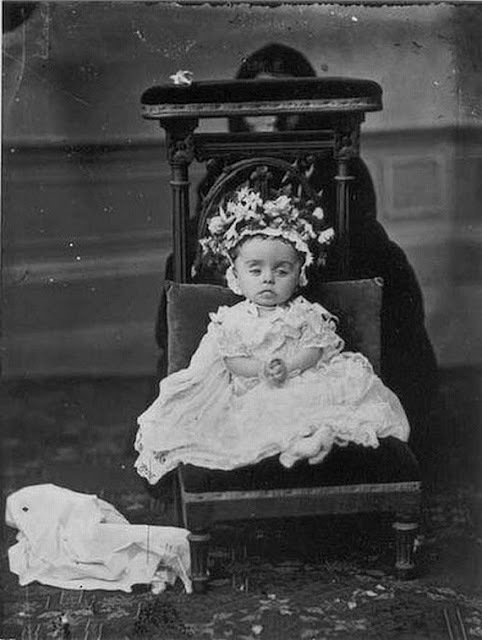 Most of these are of young children and babies and most definitely they are deceased. Some of them look so peaceful. They are sad pictures yet some are beautiful. 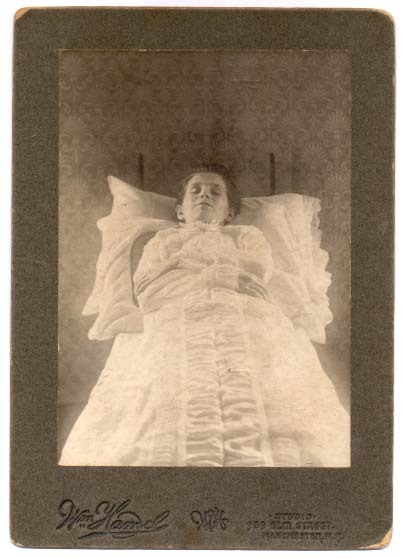 You will find post mortem pictures taken in these modern times. Some of them can be dreadfully boring in comparison. 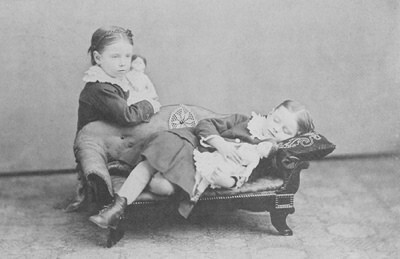 Also, the one in the easy chair, leaning on his hand, is Lewis Carroll (author of Alice in Wonderland) and we know he was not dead when this was taken. 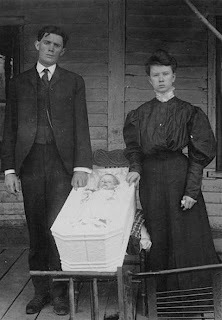 And...the baby with the black bow was in mourning, it was not dead. I agree. Especially when there's a blur on the supposed deceased, and some with eyes open and a fully dilated. 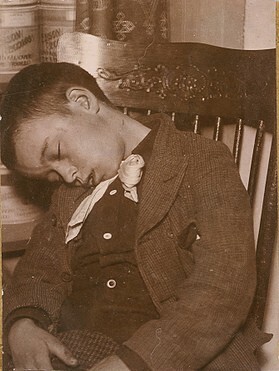 People often die with their eyes open, that is where the practice of putting a penny on the eyelids to keep the eyes shut started. Some folks think they know everything. 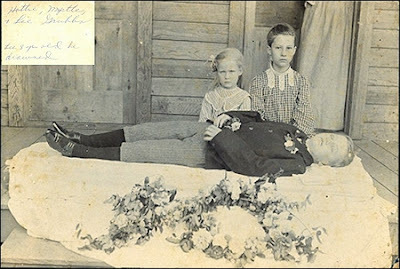 How do you know that the two girls are post-mortem and the fireman? Also, with the two girls... The way the one girl is holding the picture is an indicator. It seems like she doesn't have a grip on the picture at all, though it's arguable. The one standing up is easier to identify than the fireman. With women, you can tell that they're propped up by the way their dress looks. See how it's all wrinkled compared to the girl sitting? And just look at her pose. It looks like a mannequin. Some pictures are alot easier to identify than others (obviously). 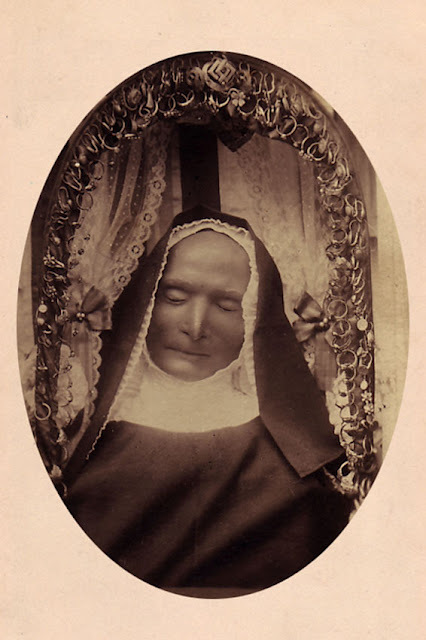 I'd assume that the wealthier families would have a photographer do everything in his power to make it look like the relative was alive. They aren't dead. Read the post above. The 4th reply to the 1st comment explains it. However, I don't agree that "most" are alive. There are a few misplaced photos. The rest are very nice examples taken from other sources and should be credited. I didn't see any sources from this post. These have been posted and reported many times by many people, most don't give credit for the source. I have several of these in various books I own. Most of the time the really nice, touching or odd ones will come from the following sources: The Thanatos Archive website, Stanley Burns Archive ( he has published many books on the subject) and Paul Frecker's website. I would hesitate to trust any research or fact finding done on the Internet unless it contained scholarly and trustworthy sources. 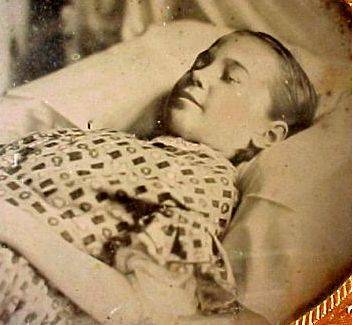 Out of the 150 photos posted here, around 20 are no doubt living subjects, while a half dozen are "premortems" and still a few others, hard to tell. Any true standing postmortems are going to be obviously dead. I Agree.. Some are no way dead.. Like for instance the fireman.. And who said? 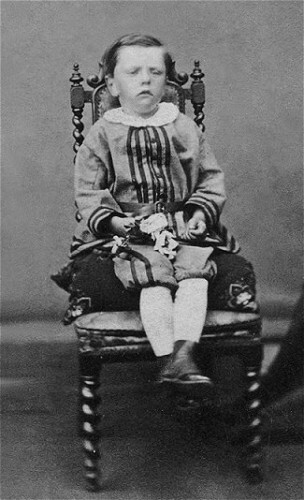 The sixth picture is just Lewis Carroll (alive) behind his camera. But anyway, thanks a lot for all that pictures. 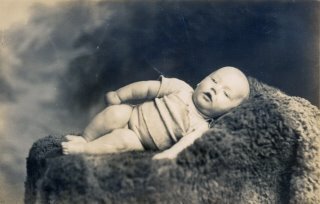 Until recently I wasn't aware of post mortum photography. I recently listened to an interview by a lady who wrote a thesis on this subject. 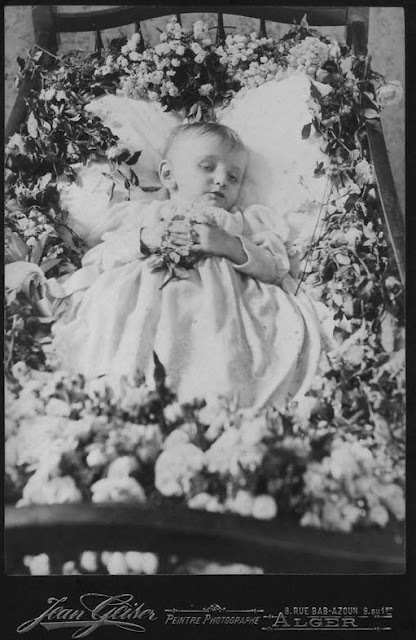 Now I've viewed these photos I feel that I understand why these families needed to have a photographic memory of their cherished loved ones, unfortunatly memories do fade with time and this can be more devistating than the original loss. 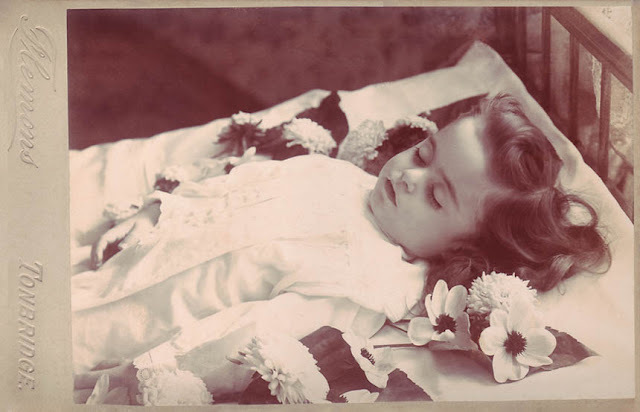 Having recently lost a family member whilst still young, I would liked to have had an opportunity to photograph them because I was unaware how peaceful they look, and for those of us grieving to look at a photo would be beneficial. Funeral Homes should offer this option to clients. These photos were beautiful thankyou. 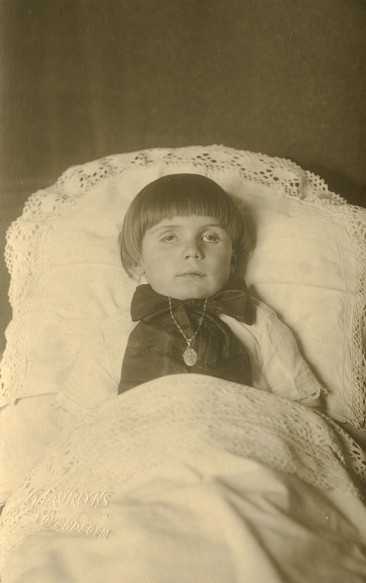 When my brother died 22 years ago the funeral home did take a picture of him in his casket. At the time I was sickened. Now, all this time later I would like to see him as he was the very last time I saw him. This may seem strange to us but death is a natural part of life, and these days it is such a taboo subject. 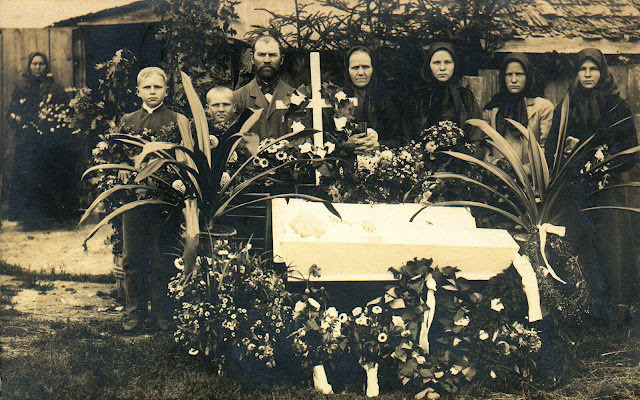 It does seem extreme but it helped people to accept a loved ones death, now people don't talk about it, and when it happens find it very hard to accept, as the funeral directors take the body, dress and do everything that these people in the victorian days did them selves. 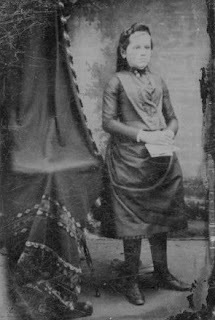 The photos were on most occasions the only photo the loved ones would have of their relatives so i can understand why they made such an effort. He's NOT dead. This has turned into an "urban legend". The coatracks is a posing stand which was commonly used on EVERYONE. They could in no way support a dead body. I think your response is the urban legend. How many living men have white eyes and walk around with their waist cinched in 3 inches with a belt? I guess it's possible, but it's just as possible that you're as wrong as you accuse others of being. The coat racks are for living subjects, not dead. You can find advertisements and pamphlets from the time period on the posing stands. They were for the living. No mention at all of being used for the dead. 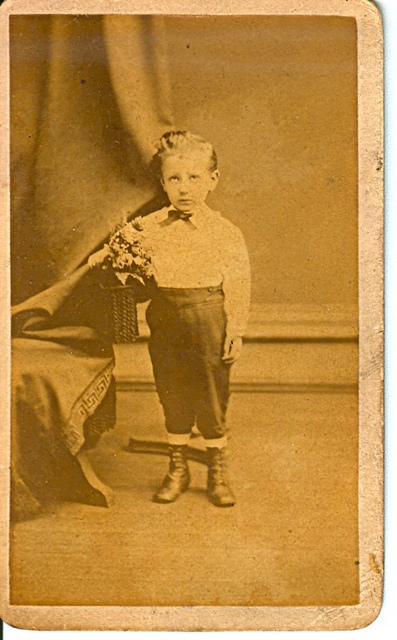 The white eyes are because cameras from that time period were extra sensitive to blue. Blue eyes would get washed out in the photos. Additionally, moving your eyes while having your picture taken would also blur them and make them appear absent. 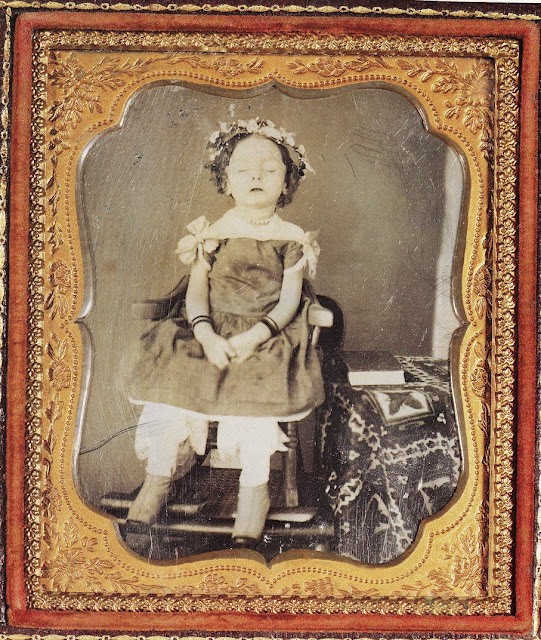 Post mortem photography definitely existed and was fairly common, but people like to label every "creepy" picture that didn't turn out right as one. 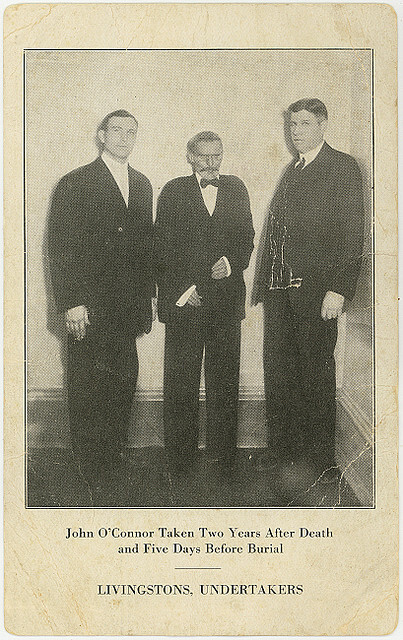 Sometimes even photographs that are completely normal get labeled. I'm guessing a live fireman as well. The eyes get messed up sometimes during long exposures as the person blinks (think about not blinking for up to 30 minutes). The posing stand is a pretty normal thing for live people...probably used more often than not due to the necessity of not moving for a long period of time (and the possibility of a ruined image due to unintentional movement). These photos are so beautiful. Absolutely mesmerizeing. I think today the vast majority have become detached from Death and it's viewed as a taboo subject. 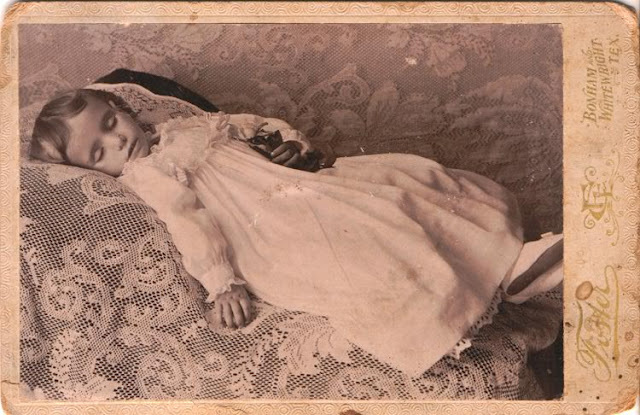 I think the first time I knew of these type of pictures was during watching 'The Others' movie. In Victorian times and even afterwards death was much nearer to people than today and people used to bring coffins back to the house for days before the funeral. 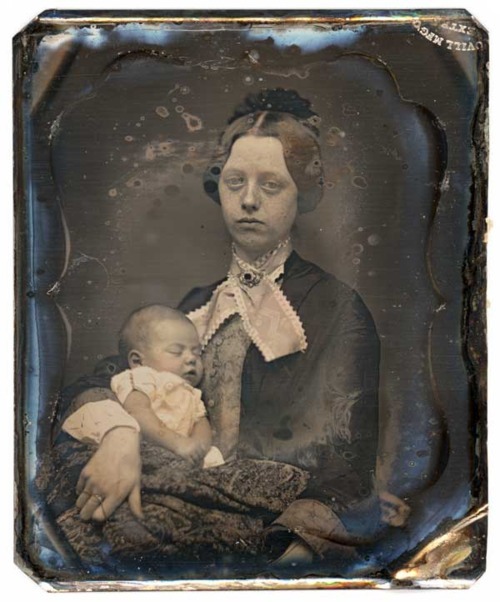 Please learn something about the practice of photography in the 19th century! The base seen behind the standing people here is not proof that they are dead but that they are alive and could move and spoil the picture. 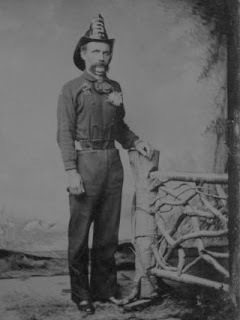 This is called a posing stand or a head brace and in no way was used or able to hold anyone up. 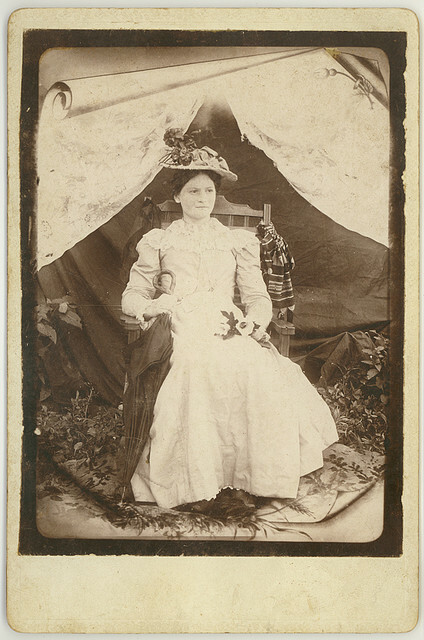 In the 19th century when exposures were several seconds the head brace made it easier for the subject to stand still. 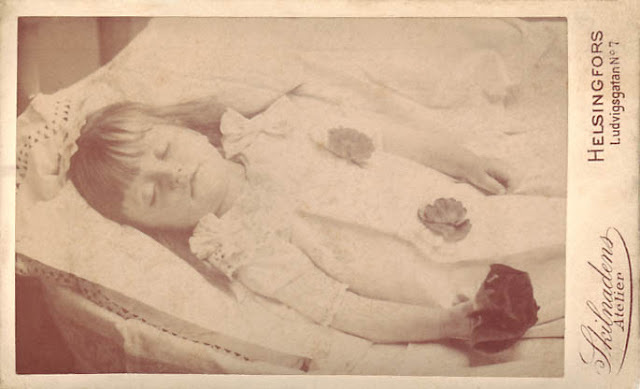 There are many real post mortem photographs made and many shown here are indeed post mortems. That said ALL the standing and several of the others are very ordinary photographs or very alive people. I have studied and taught the history of photography and collected post mortems for more than 30 years and I am appalled at the incorrect information that is flooding the internet and with the multiple sellers on eBay of blatantly mislabeled post mortem photographs. 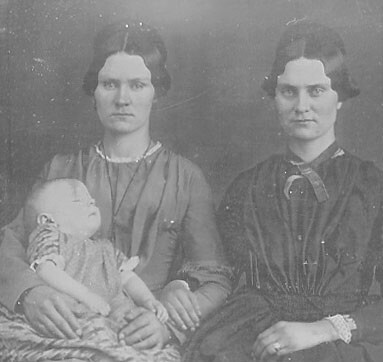 The picture of the two women, one standing the other sitting disputes your theory. Look at the hands of the standing one. 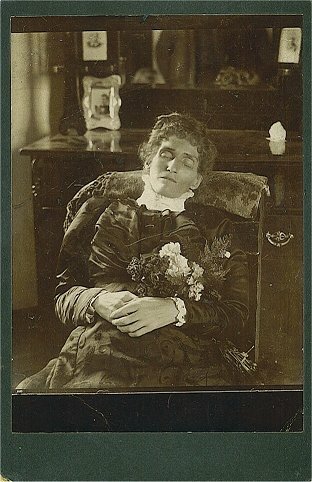 She is obviously deceased. Says someone posting anonymously on the internet. 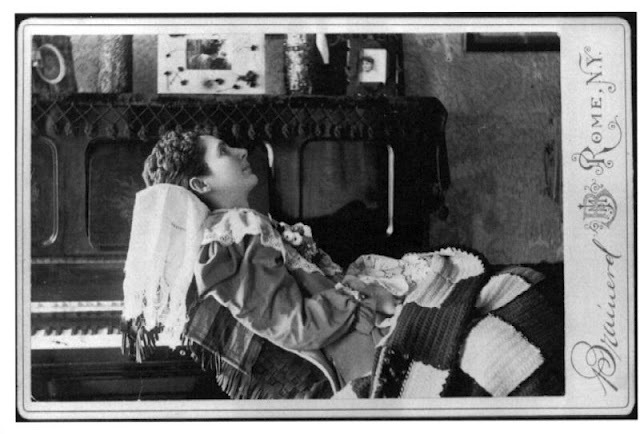 They used the stands on both living and dead. you are a truly digusting and sicj person. Get help. 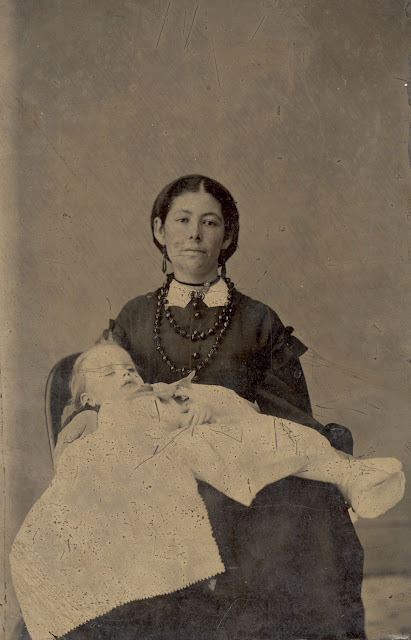 Who says f*** her aboit a random baby? You're sick. You jerks! 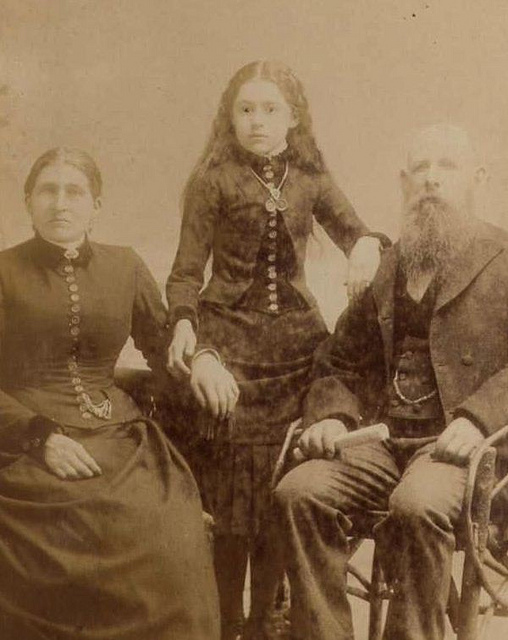 I cannot believe you think any of these people were alive when their photograph was taken! All you need to do is stare into the face of death, the lack of a soul, the dilated eyes, blank stares, the concave chest of the fireman, the stiffness of the propped up bodies BECAUSE A DEAD BODY WOULD REQUIRE A POLE TO HOLD IT UP!, the loose hands and arms...many of the phoyos have heavy touch ups. but you ARE looking at the dearly departed. 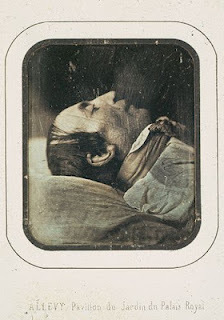 It is amazing how ignorant you are to the history of 19th century photography, the use of Posing stands, and the scientific facts about what it would actually involve trying to get a corpse to appear to be standing and look even half that alive. 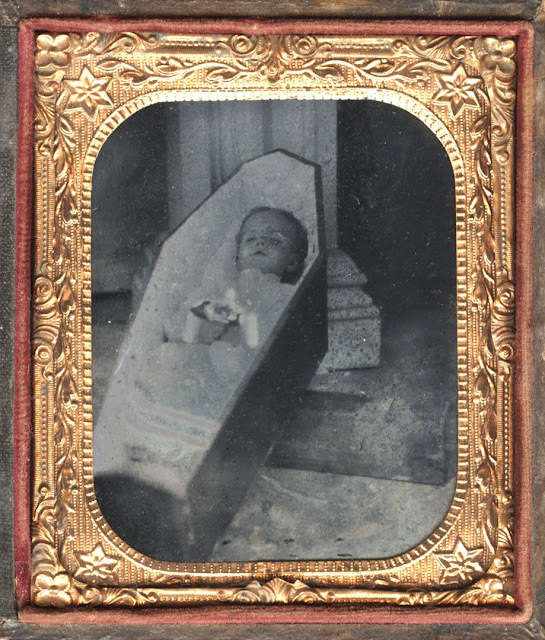 The seventh photo from the bottom clearly shows two children very much ALIVE with the Posing stands being used as props in this case. 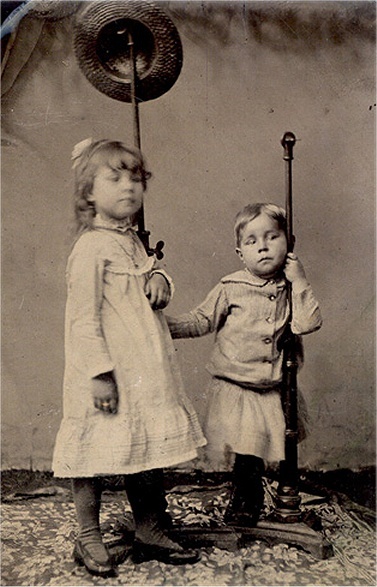 The two Posing stands appear to have had the neck supporters removed, and if utilized, would have helped prevent the slight movement made by the taller subject causing a blurry face. 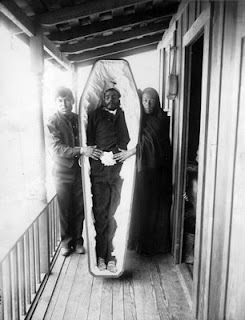 Posing stands were made for and intended to prevent such movements from occurring during the photographic process, NOT for "supporting" a dead body in a standing position. SERIOUS collectors of 19th century postmortem photos know the facts, as do serious collectors of 19th C. photography. 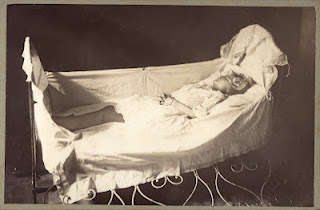 And really, even if one does an internet search on this subject, it wont take long at all to find that the "STANDING postmortem" by way of a "stand" with wires and/or other devises is no more than a mythical idea and was NOT a common practice, and are essentially non existent. 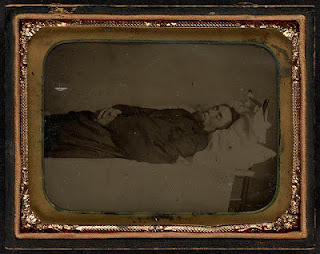 An AUTHENTIC standing postmortem (body in standing pose,) from the 19th century would be extremely rare and would involve a lot more than a Posing stand or a "pole" with a belt & wires. DO YOUR HOME WORK! 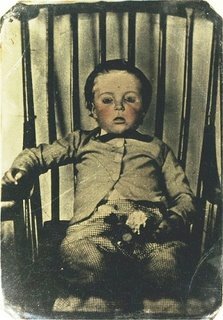 Obviously you are not well educated in the different processes of 19th c. photography, or the history of postmortem photography. It sounds like you're unaware of the effects of rigor mortis and the rigidity of a body that's been dead for awhile. 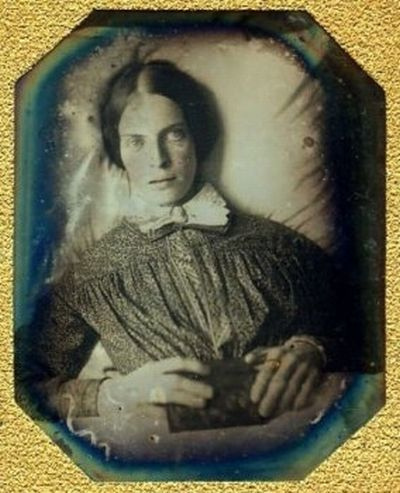 A well-anchored pole could indeed support a body for portraiture and it wouldn't require winches, wires or anything of the sort, assuming the body had been posed prior to the onset of rigor mortis. Trying to pose a recumbant body afterwards would entail the breaking of bones and other damage, which would likely make any posing difficult or impossible. 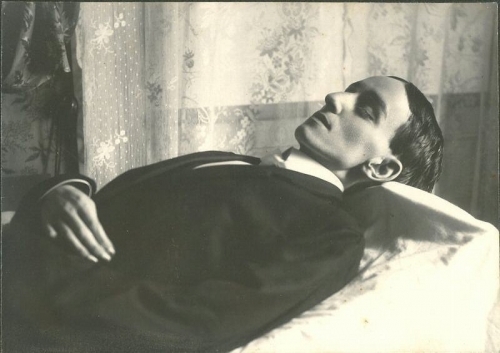 Rigor mortis starts 3-4 hours after death and the body reaches full rigidity after around 12 hours. Rigor isn't permanent, it dissipates gradually after around 24 hours. 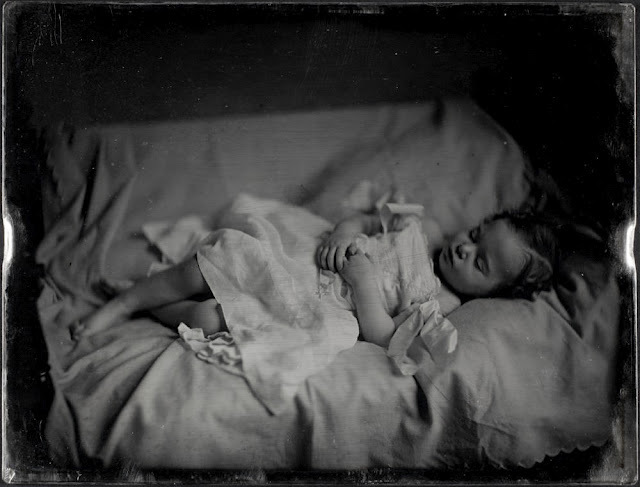 A body doesn't stay stiff, so it could be reposed once rigor dissipates. A posing stand was very flimsy.For an experiment, get a friend around 150 pounds and have them go totally limp. Then try to prop them up and tie them to a post, floor lamp etc. Just try to keep the body from falling, collapsing!!! 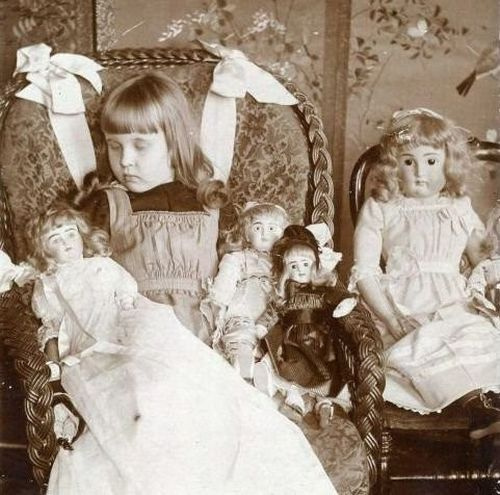 Have you every tried to even put a doll on a doll stand? Pretty hard huh! And if the person was in rigor try to bend their arms or pose without looking like A STIFF Ha ha!! "" And why would the photographer go to all the trouble to pose standing when they could just plop the corpse in a chair??? Yes, there are a very few true standing pms but they are so rare they command megs bucks. Rationalize all you want but I could if space permitted, debunk every photo you claim are pms. 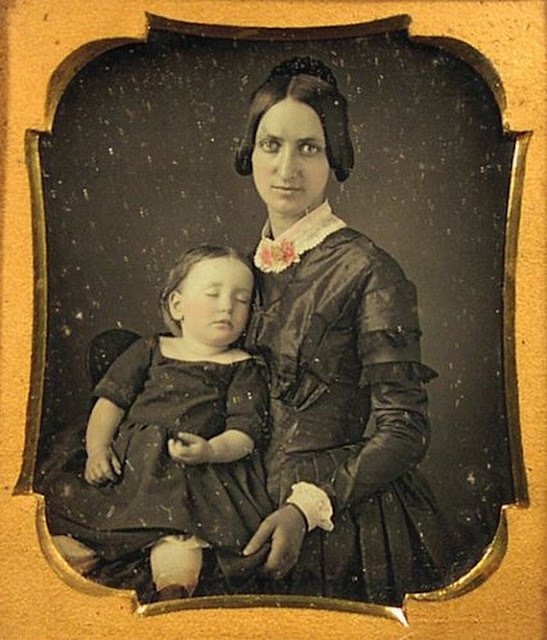 Many other photos here are living also, closed eyes if you children or babies are just sleeping kids, or told to close their eyes rather than blink. 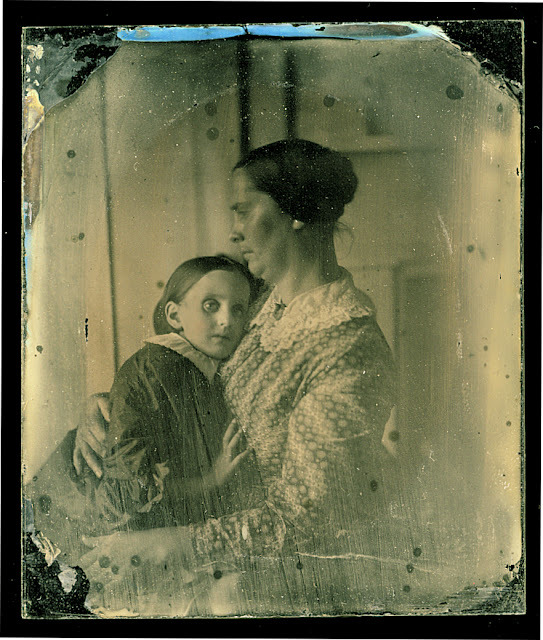 Dark hands, "dead eyes" are just artifacts of early photography. Say pm all you want.. You will still be ignorantly wrong!! 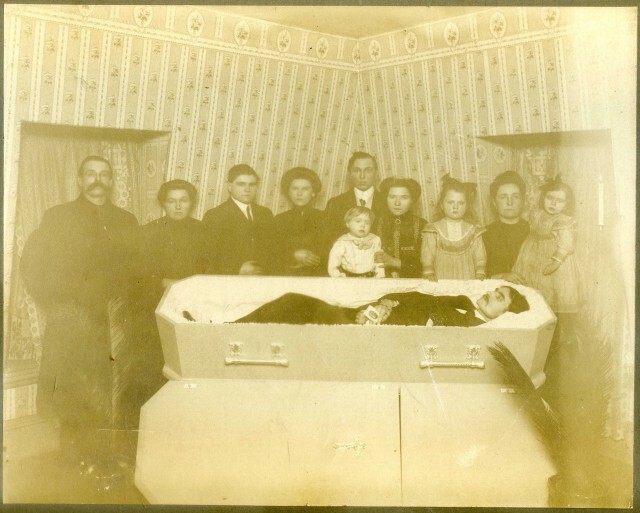 I do believe that a couple of the standing photos are actually deceased. 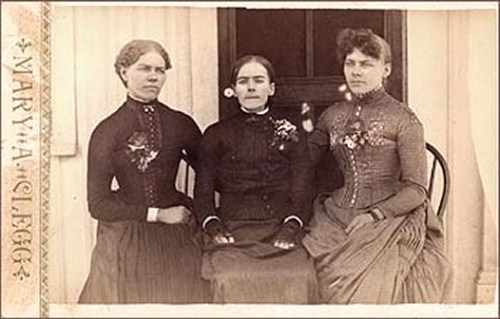 Notice that the hands are very dark & mottled, a very different color from their faces & of the hands of the others in the photo. I also noticed the bunched up dresses, as if being slightly lifted from behind. One actually has a curtain gathered behind where you can distinguish that hands (or something) is on the other side holding up the body. 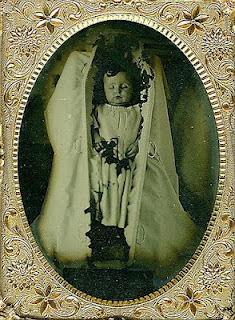 Love post mortem pix I want mines too! 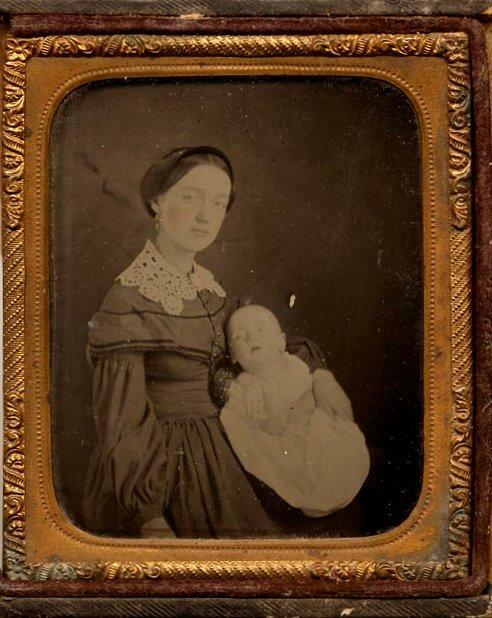 The picture where the lady is holding the baby with the white dress and the big bow on the shoulder... I do not believe either one of them is dead. 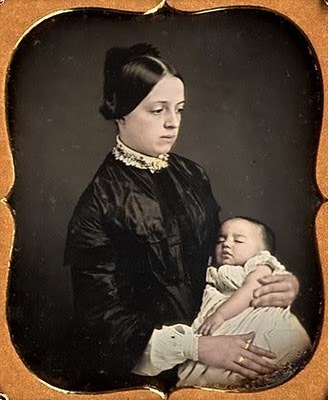 If you are dead your muscles are completely relaxed... so obvsiouly the mother is not dead, and the baby is holding her head up and you can tell by the facial expression, the muscles are not relaxed. They are both looking intently. Look at the eyebrows, too. 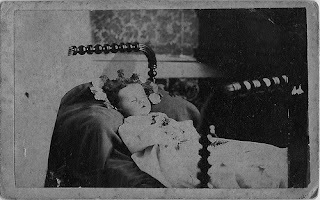 A few of these pictures are definitely not postmortem, but a lot are. A very decent amount of these aren't post mortem. What a joke. 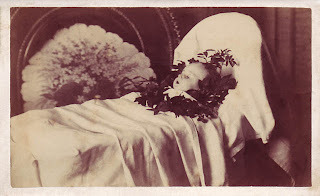 Do some research and realize that you have posted many photos of people who are NOT dead. 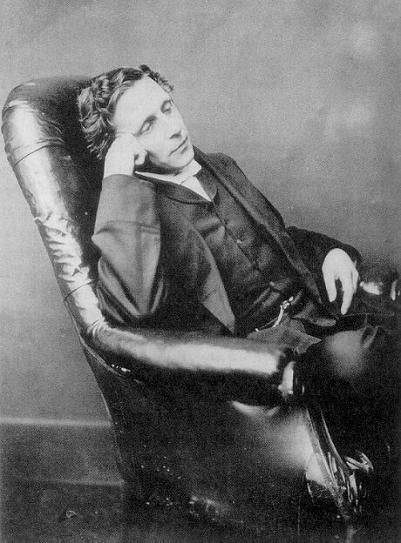 By the way, nice photo of "dead" Lewis Carroll (aka Charles Dodgson) who wrote Alice in Wonderland. 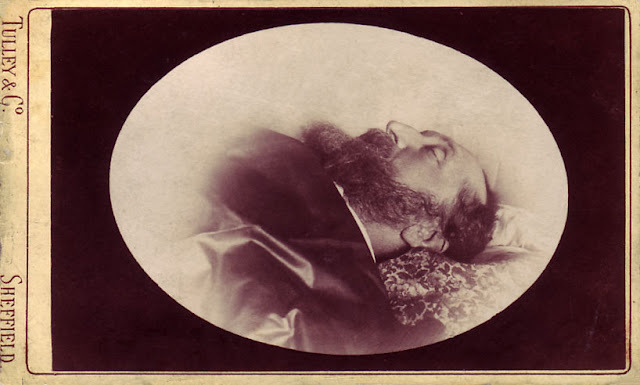 Wonder how he did that, being dead and all in that photo that was taken years before he wrote his famous book? 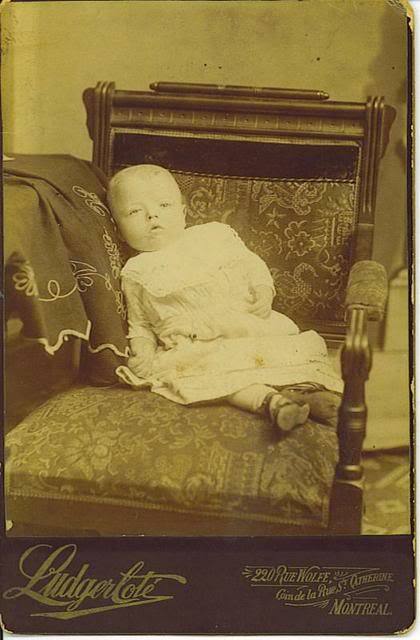 Anyone holding their own head up, focusing their own eyes on the camera or sitting up straight was alive. Anyone with a stand behind them was alive because stands were ONLY used to help keep live people still during long shutter exposures. 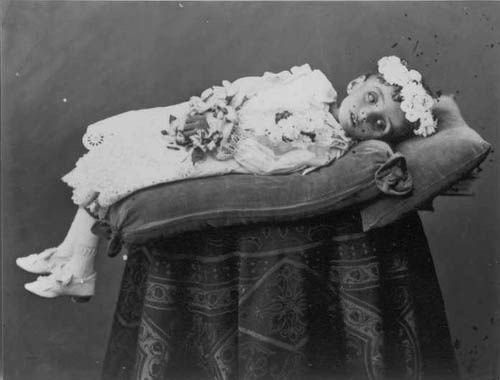 They could not support the dead weight of a corpse, even a child. The baby with the black bow was in mourning. It was not dead. 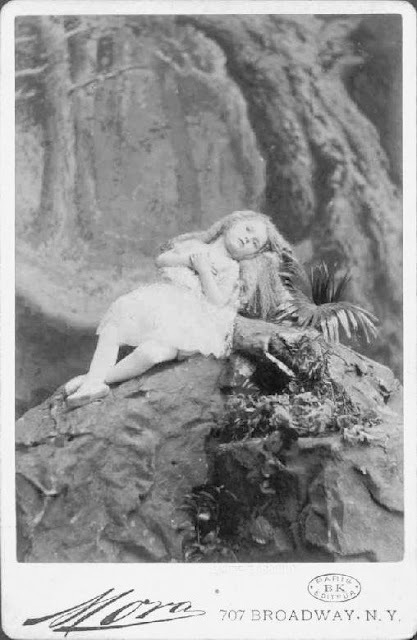 Yes, that's Lewis Carroll.. and not dead. 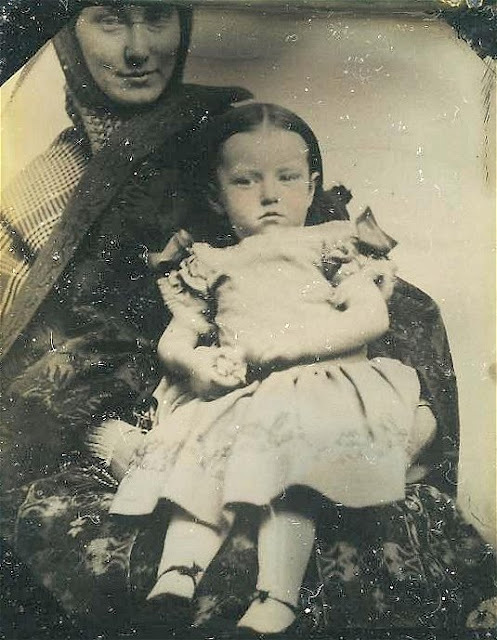 However, this photo was taken when Carroll when he was middle aged, way after writing the Alice books. He was only in his early 30s when Wonderland was published. 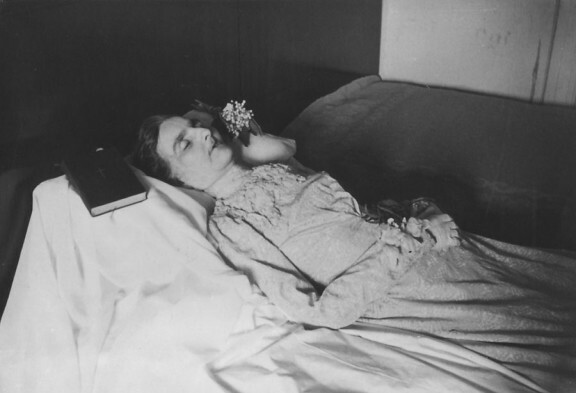 As a nurse I have handled countless dead bodies. No way could any pole be used to support their weight, and no way could they be posed after they very quickly stiffen with rigor. It just is not possible. As a Nurse, I would think you would also know that Rigor usually only lasts for a 24 hours period. Most of these pictures were taken after Rigor left. In these days, it was not at all uncommon to have a body around a house for days and even weeks until burial. 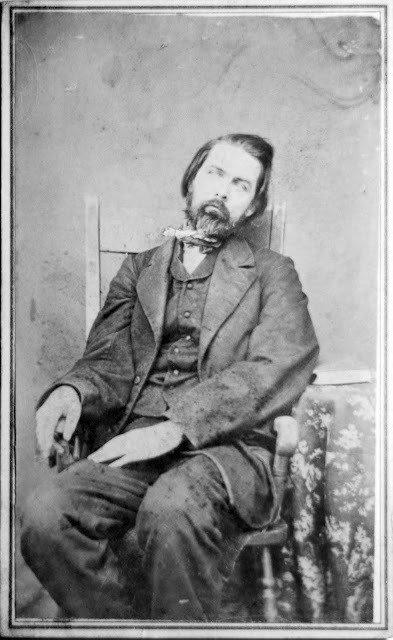 mortis, once set in, would generally preserve the pose. And yes, rigor does subside and the body will again be in a state where posing is possible. 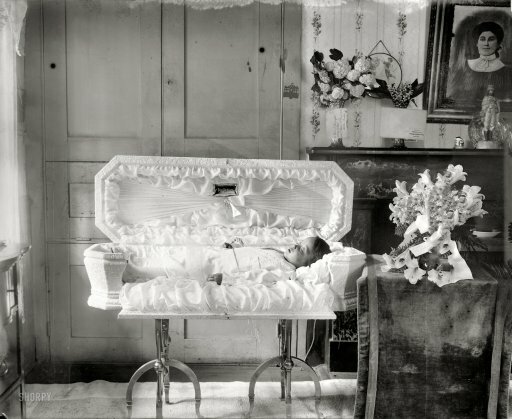 For families where mourners traveled from great distances, bodies were indeed kept in the "parlor" of the house for extended periods of time until burial. One more comment....I DO know of iron poles, with well anchored or weighted bases that could EASILY support the weight of 500lbs or more. I don't think Lisa A. is really a nurse. 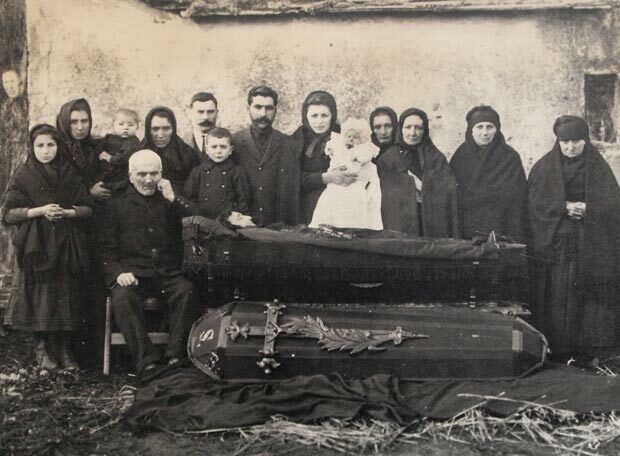 "OK dear, now come and pose in this picture next to your dead brother." " . . . but Mooooooooom!" "I SAID GET IN THE PICTURE!!" 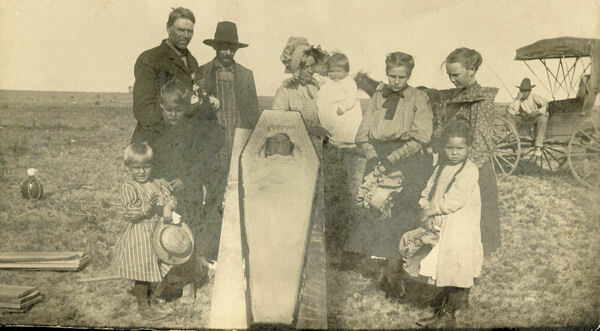 To those of you who are saying that posing with deceased siblings is affecting the children, I would point out that you have little understanding of how Death was dealt with at this time. 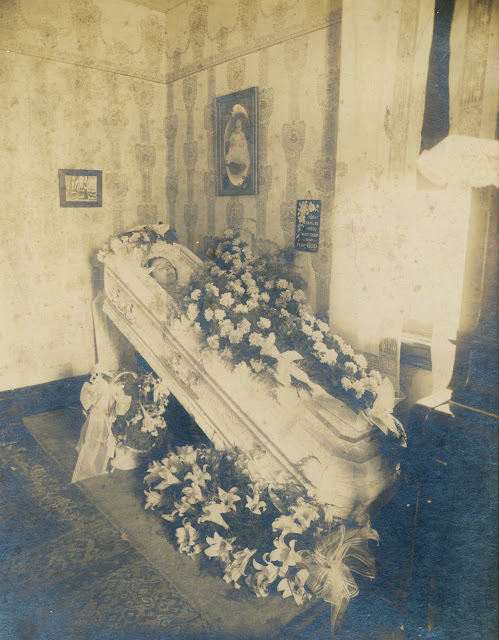 Funeral homes were not that popular yet and most funerals took place at home. 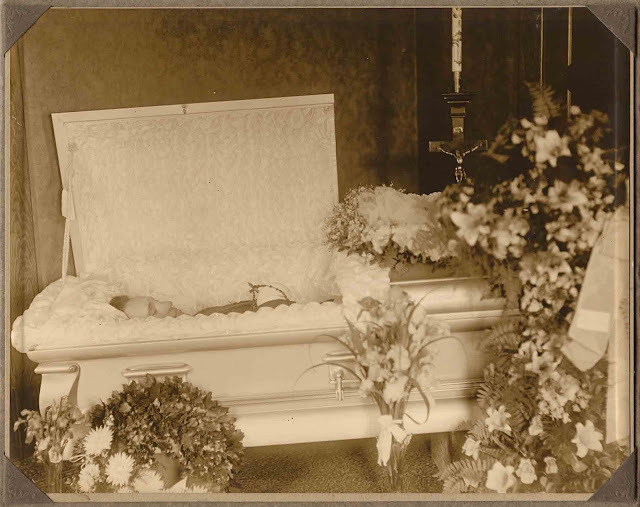 The deceased would be displayed in the "Parlor" (What we call the "Living Room" today, which you can thank the Funeral Industry for) and Death was far more common. These kids would likely have seen a number of dead bodies by then, and it didn't hold the same distant horror that it holds today. 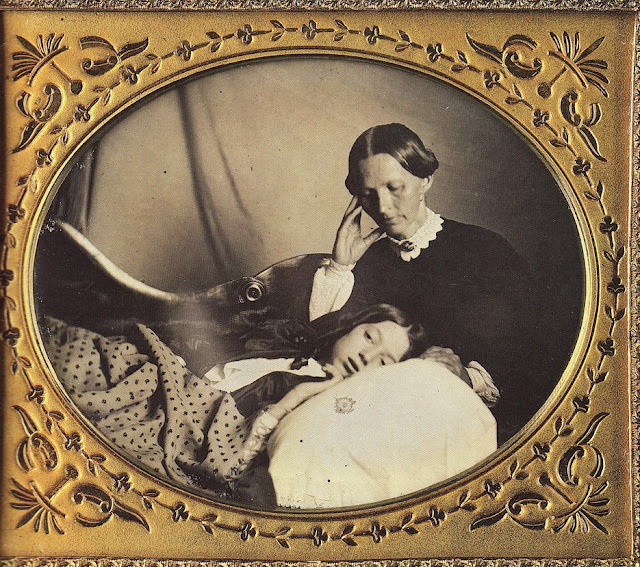 The death of a loved one was something that was dealt with, in all meanings of the word at home, by the family. You are attempting to put today's standards and morality on History. You can not do this if you wish to understand the past. it's been my experience, because i work in a rest home, that wheather sitting up, or lying down, the jaw most of the time hangs open, and if sitting up a bit, the head always leans to the left or right. i hear that it's not possible for them to stand, but my question is, if riggor sets in...why can't they? just sayin. Photographers where/are artists. 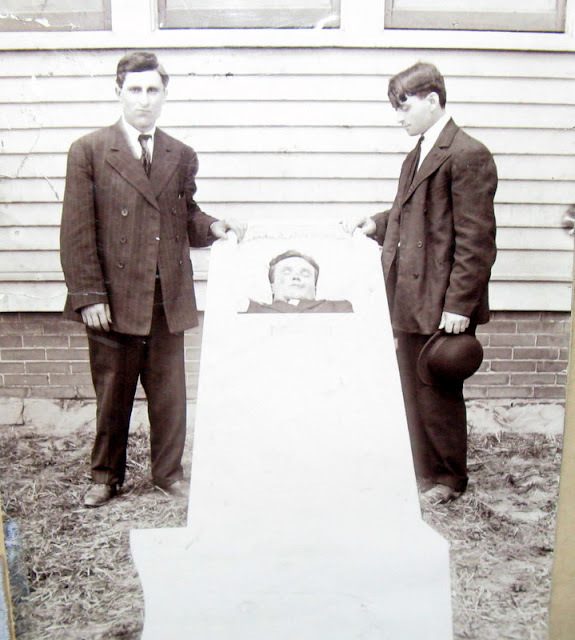 How can anyone here say for certain that stands where not used to prop up the dead? Where you there? And anyone that thinks a stand could not prop up a dead person severely underestimate the intelligence of the photographers. Wood came in all sorts of strengths back then as it does now. And why for a second would anyone doubt that some stands could have been made from steel. It is true that they approached death differently back then. 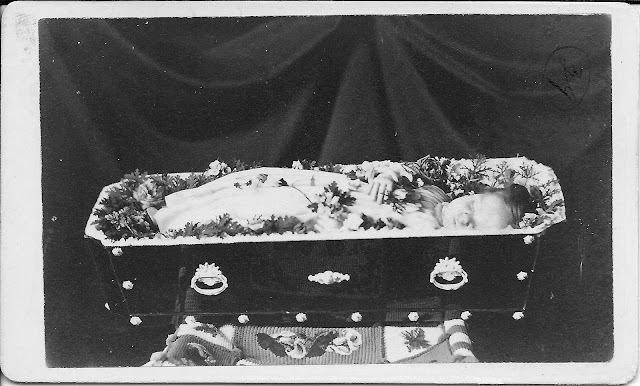 Some countries still practise what others may label macabre post mortem rituals, like displaying the bones etc. 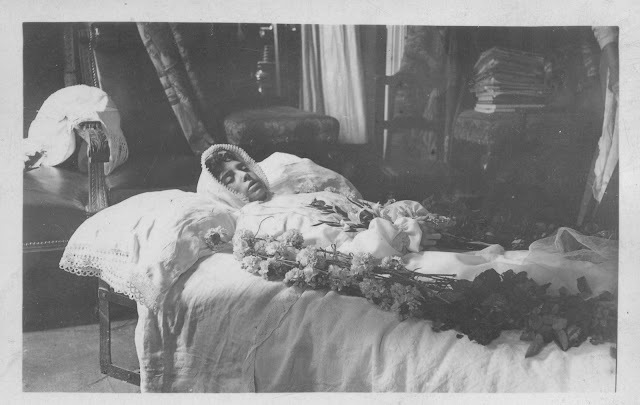 If you wanted to take a photo of a deceased person, and make it look as life like as possible, then why on earth wouldn't they have used sturdy stands to prop up the dead? It just absurd to outright rule it out. Truth is, there really is not conclusive way to tell if any of them are dead or not. Rigor mortis (allowing rigid poses to be held) doesn't take long to wear off, true, but one could easily assume that many deaths occurred in town, close to a photography studio making it easier to produce. And if you understand the era, 'cracking' a person into shape would not have phased them, in fact I would not be surprised if they timed it to assist with the process. Why do people assume that they were to dumb to think of these things back then. That is first class ignorance. AND..... it was happening all over the world....So who really knows how many different styles and techniques were being employed.... Because you read it or studied it. Did EVERY SINGLE photographer write their own book or even pass on their techniques? Who could afford to self publish, and there really were so many photographers why would anybody write a book for each of them? I can say that posing stands were never used to prop up dead bodies like scarecrows! How do I know? 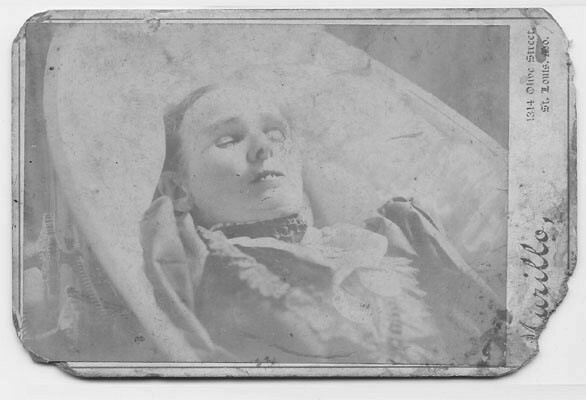 I have read dozens of photographic manuals from Victorian times and in NONE of them does it say anything about propping up the dead. The stands people point to as holding up dead bodies could never do that. Dead bodies are limp and heavy. It would be impossible for those stands to hold them up. 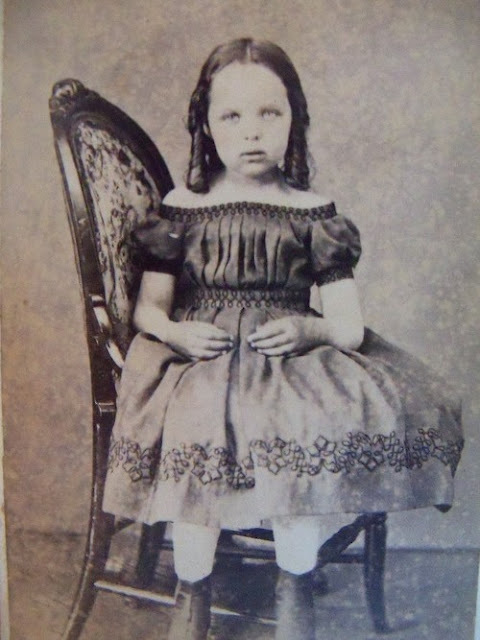 Also, I've been studying Victorian culture and as part of my job for many years. 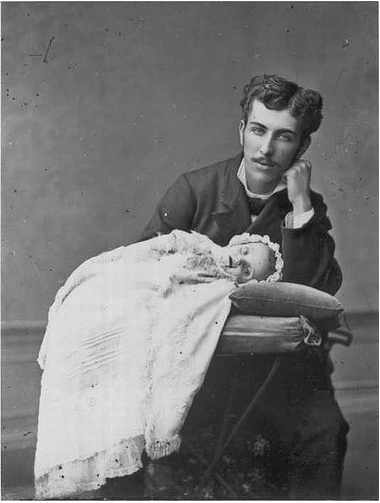 Victorians never wanted their dead to look life-like. They would abhor that. 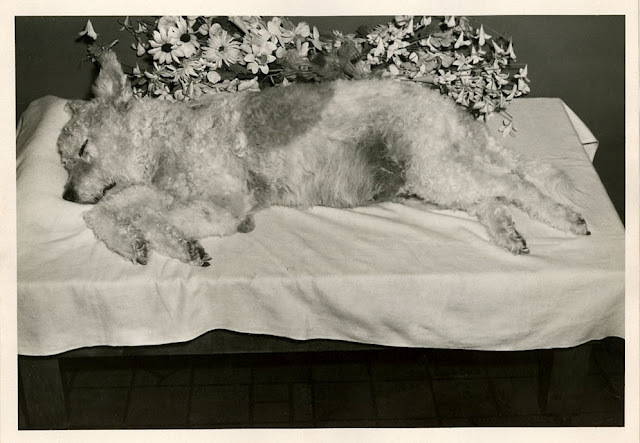 They wanted their dead to look like they were peaceful and in repose. 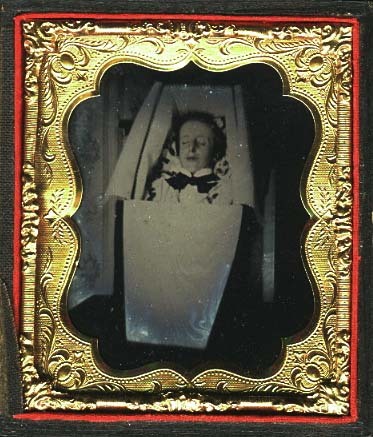 Yes, Anonymous, I can say definitely that Victorians did NOT prop up their dead with little stands to make them look life-like. Don't believe the moronic sites that say otherwise. Picture no. 15 from up above - the standing woman with the candle. 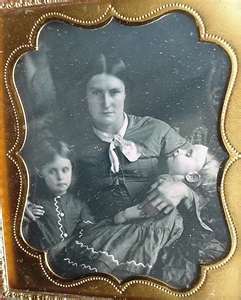 Does anyone have some info about that photo? Who she was? 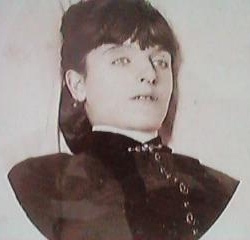 Why she died? 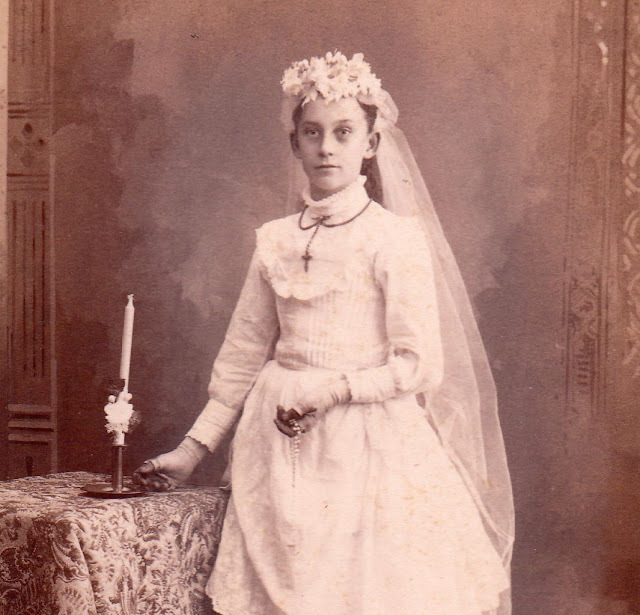 It looks like she's wearing a wedding dress. 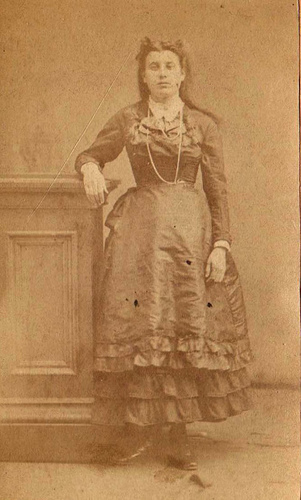 Also it looks like she was either born into a wealthy family or married a wealthy man - or both! The jewlery in her hand tells me so. A name could be nice. Thank you in advance. That's exactly what I was thinking. 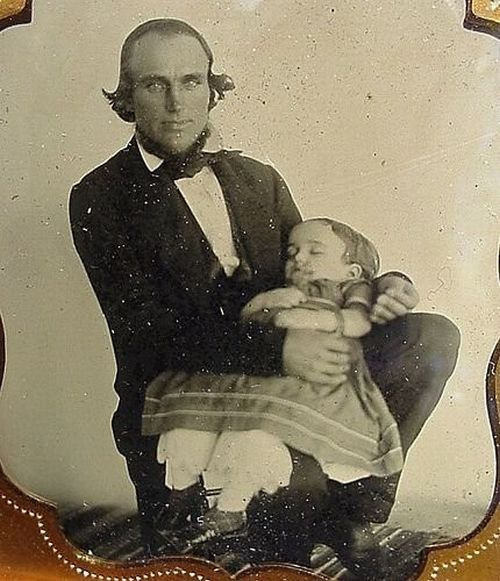 They didn't embalm much back then, so they had to get the photographer there fast. They also didn't have restorative art like we have now, and a deceased person won't look natural for very long without it. There weren't phones to call a photographer on either. 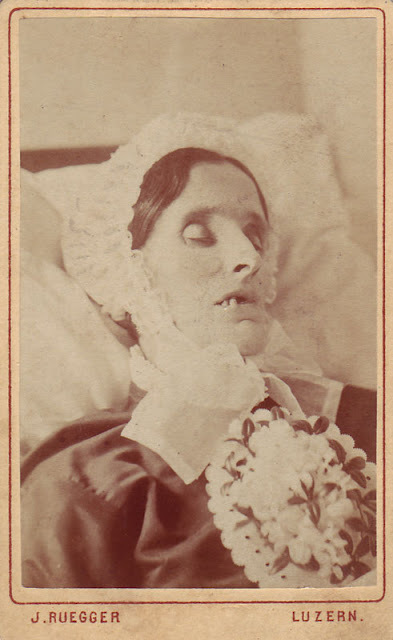 Perhaps when someone was dying they contacted the photographer ahead of time to get that last picture. Indeed as several people have stated a good number of these images are not post mortem. They are live people with a posing stand to help them stand still. 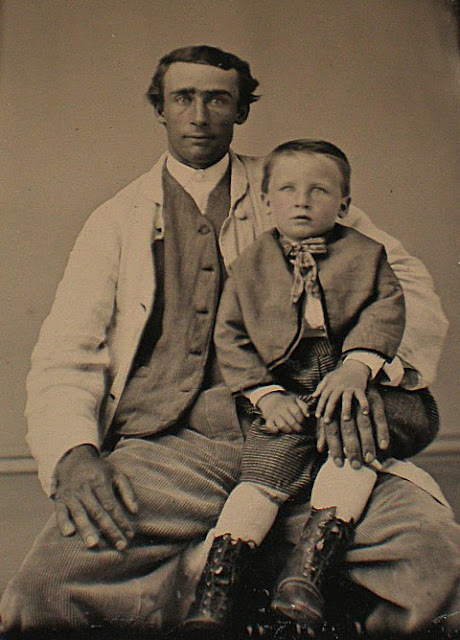 The emulsions of the time were over sensitive to blue and blue eyes can look white. 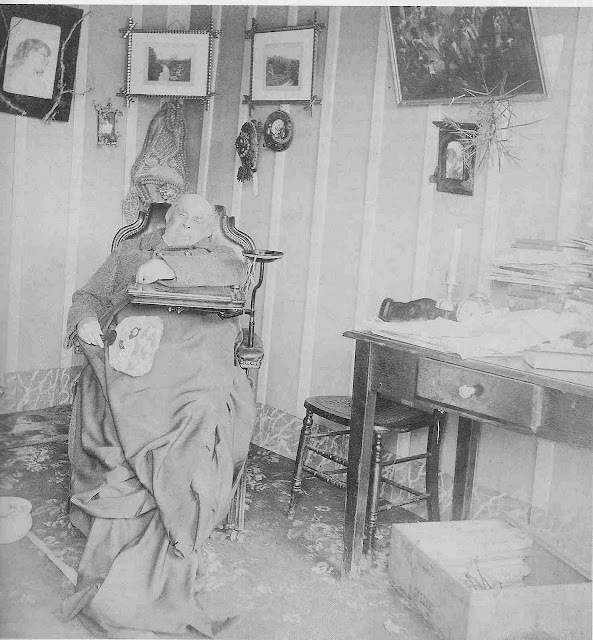 The easies to to prove is the one of the man sitting in a leather chair and leaning on his hand. 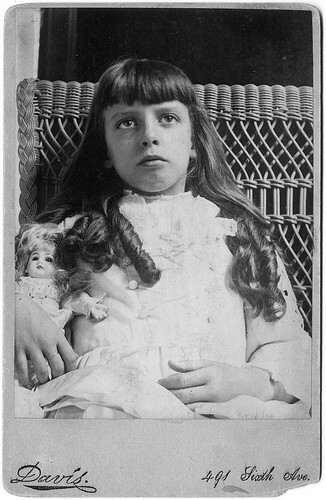 It is an identified portrait of Lewis Carroll and he lived for many years after this photograph was made. Some are of very ill people but not yet dead and some are jokes. These are perfect examples of the danger of getting information from the internet. Beautiful photography. The people who captured all these photos are just so talented. So many of them were children. We take it for granted that our children will live and be healthy. 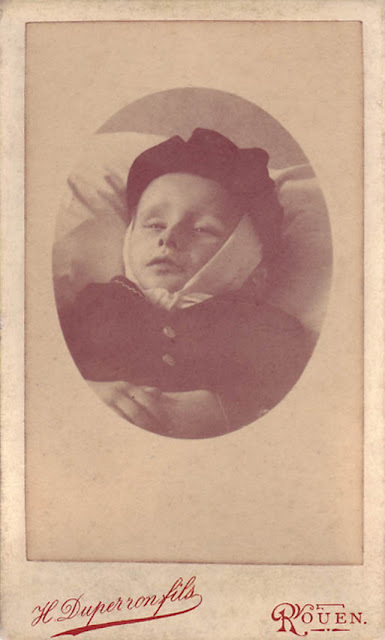 It's a reminder how many children died before modern medicine. What about the people in coffins? 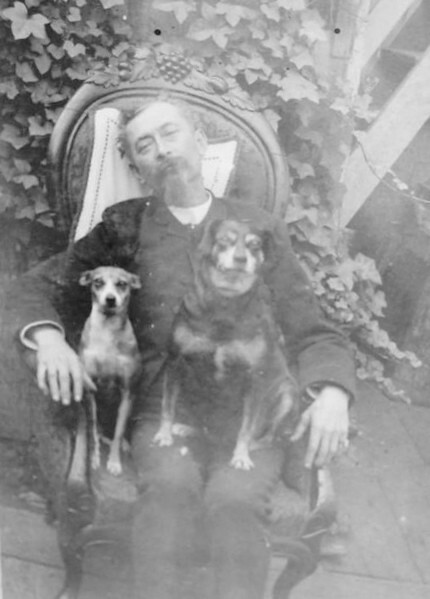 Were *they* still alive when the photos were taken? 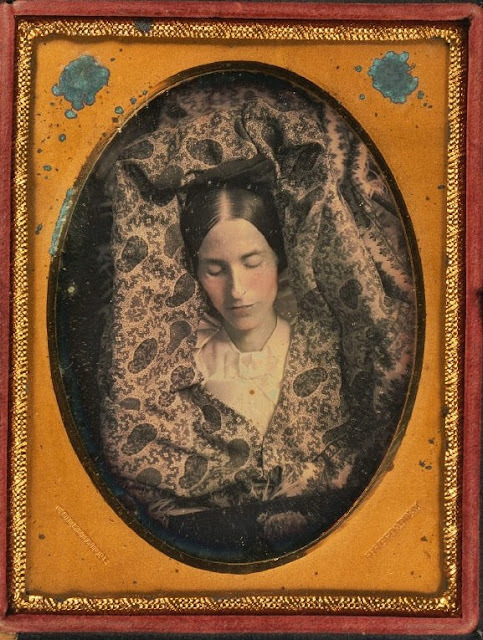 Did the Victorians enjoy posing for portraits in coffins? 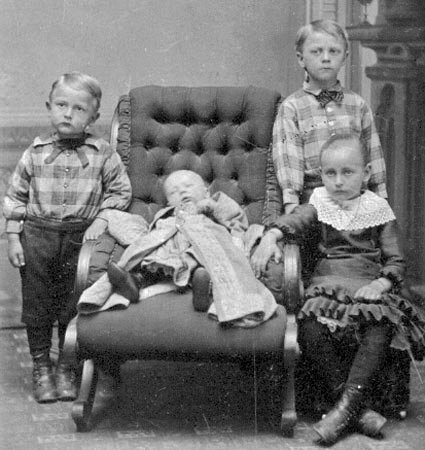 And what about the little boy sitting with his head flopping listlessly to the right? 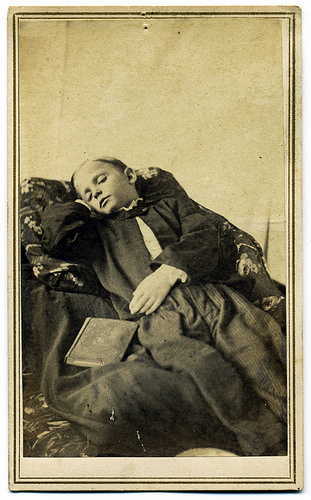 Are you saying that kid fell asleep and no one woke him up before snapping the shot? He sure looks dead to ME. 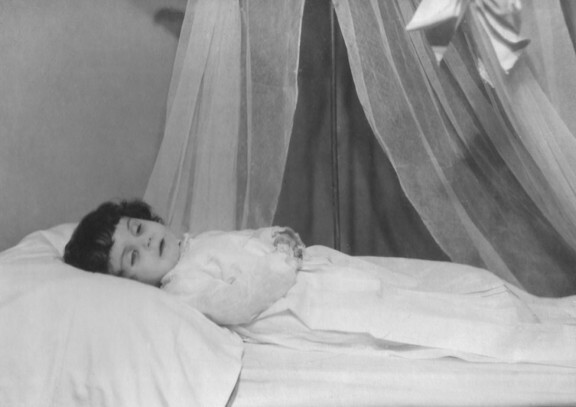 Kids are more likely to not move when they are sleeping, so yes! Possibly! 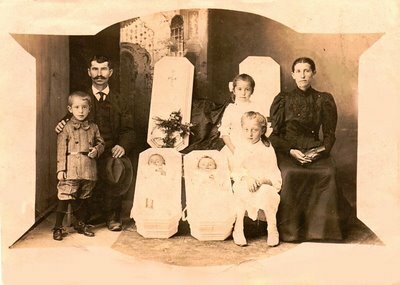 The ones in the coffins are dead. Some that are laying are dead. 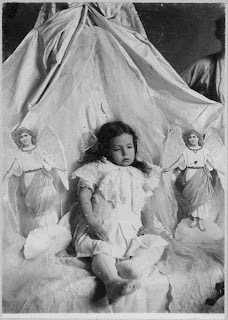 A few that are upright were actually posed laying then turned to appear as if upright. But some were just boring old alive people with boring old bored expressions, waiting for this guy to finish up their photo so they could continue their boring old lives. "Kids are more likely to not move when they are sleeping" ??? You definitely aren't a parent! 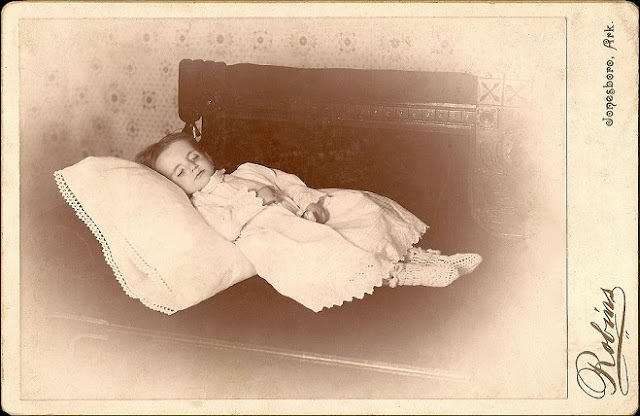 Don't misunderstand, I'm not saying ALL children, ALL the time, but they move OFTEN and unpredictably in sleep! As expensive as these photos were to make, I can't imagine they would risk taking a photo of ANYONE sleeping. A good jerk, shift, or any movement beyond a twitch would likely ruin an exposure, as well as waste money. Could it have been done? I suppose (unlike a lot of "experts and so richly informed" people here, I rarely say anything is impossible, ESPECIALLY when speaking on a subject that no one here can be witness to) but I sincerely doubt it. Now everyone tell me how dumb and ignorant I am! 3-2-1 TROLL! Have you ever tried to photograph a screaming crying I'd bored child? I guess not . 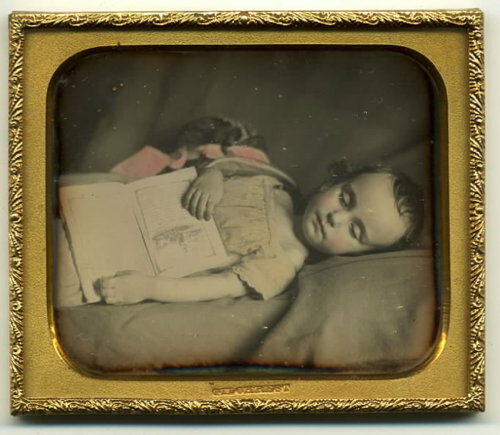 Maybe a sleeping child might move and ruin the portrait, but not as likely as one that is sleeping I'd told to fein sleep. By the way, Lewis Carroll also a portrait photographer had a lot to say about thus subject in his journals and in his poem, "Photographing Hyawatha" Read it. 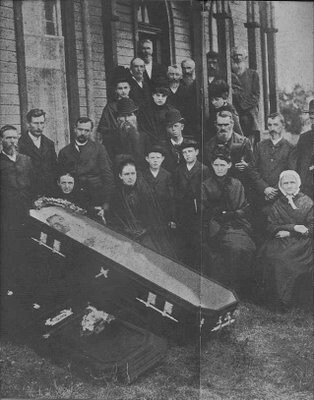 The people in coffins are dead. All the people standing and more than a few of the seated people are NOT dead. 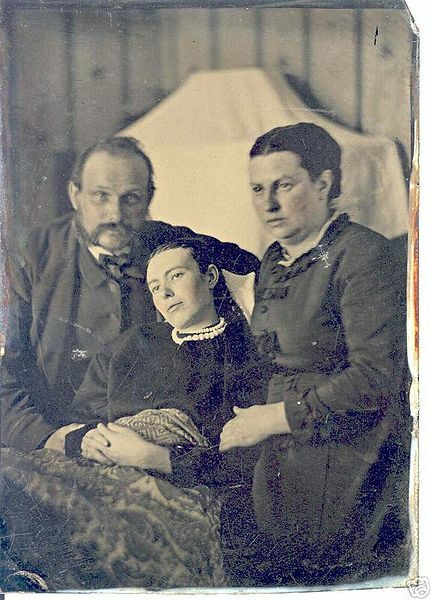 I have collected and studied the history of photography for more than 40 years and can say with absolute certainty that the posing stand was NEVER used to hold up dead people. There was noting on a posing stand to attach a body. 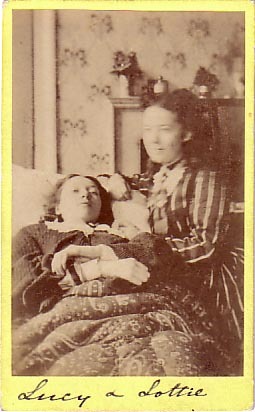 They were also called head rests since the head and back simply touched it to help the subject to hold still and in place. The fireman is not dead. 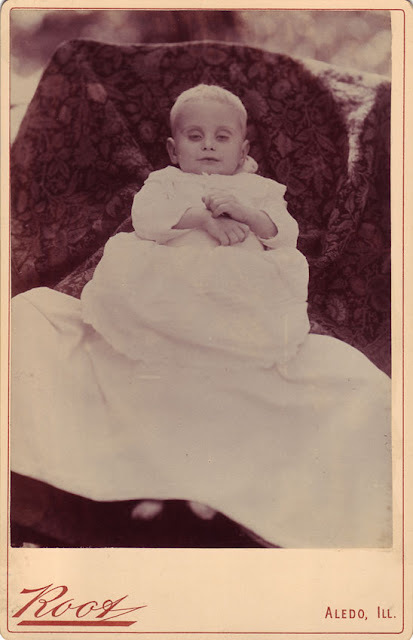 His eyes are not white they were light blue which recorded as white with the emulsion of the time. The dark hands are not a sign of death either. Red recorded as very dark so sunburned hands would be darker. You have been sold a load of myths by dishonest eBay sellers and clueless Pinterest posters. 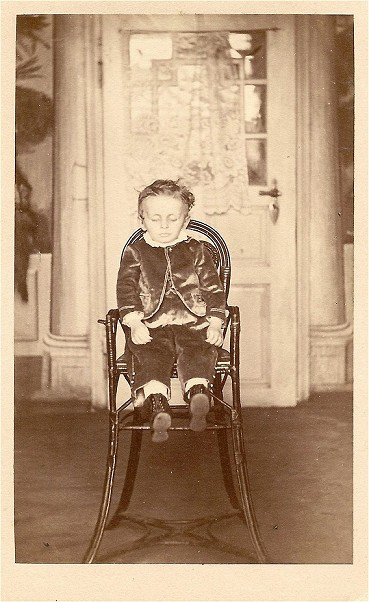 Indeed you are right... let's also remember the long exposure times and the need to remain still meant that posing stands were used on children to keep them from fidgeting. 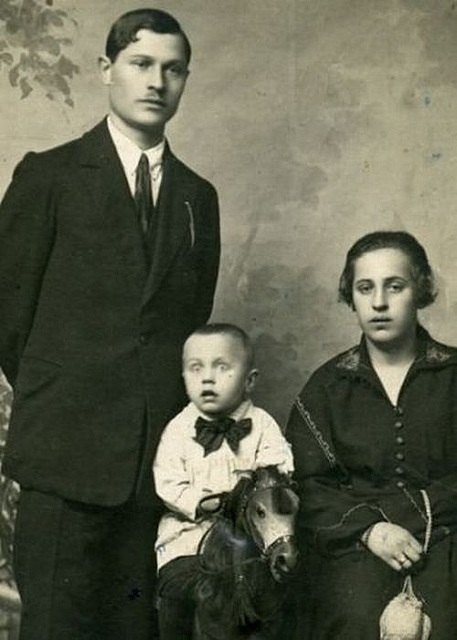 Who's dead in the pic of the dad, kid in rocking horse and mum? It either has to be the dad, both of them which could be the horror on the boys face or all 3. 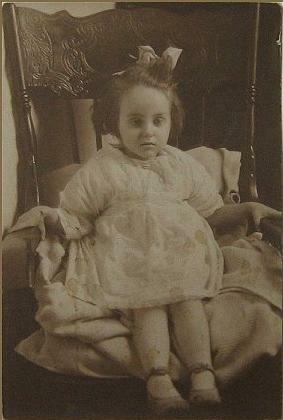 Does anyone have any information about the photo girl0000.jpg? 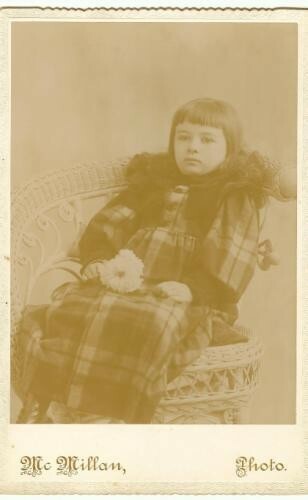 I've researched it to be around 1877 and the young girl may be called Catherine but I'm trying to find out more information. Does anyone have any leads? 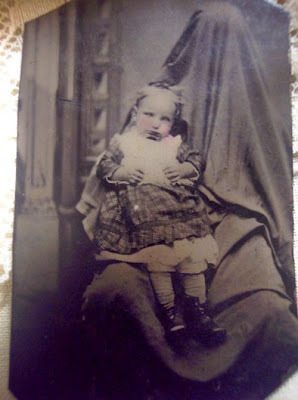 im trying to find out information on the second picture down, as the little girl in the picture is identica lto my daughter?? Clearly some are not dead. Would the people who posted these photos please explain why they think that the two young ladies (one standing, one sitting holding photo) are DEAD? If they look like they are alive, you must have some reason you are telling us they are dead. You posted the photos. Please explain or remove them! 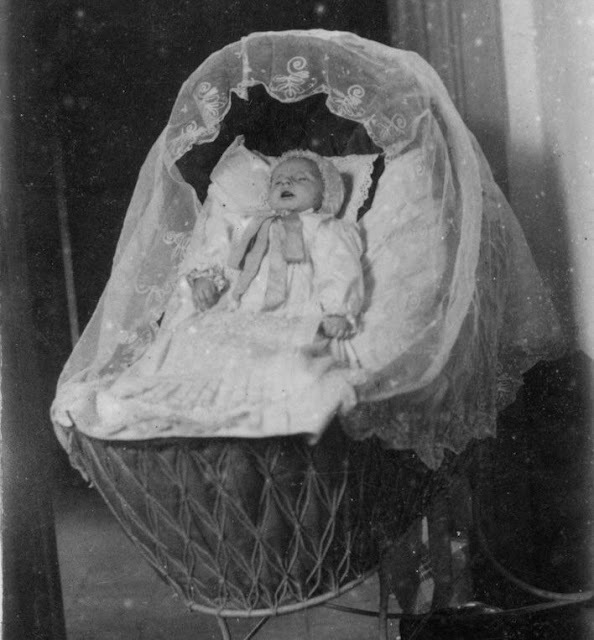 You know I think it's morbid today to do that but not so long ago. The reason not everyone had a camera to afford to take a picture. Today there is no excuse to take a picture. Understand? Agreed. 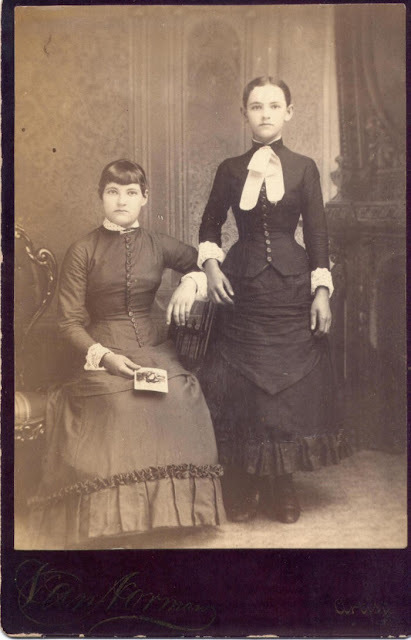 The photo of the 2 girls, standing and sitting is totally false. No way were these 2 dead and who ever thought they were! 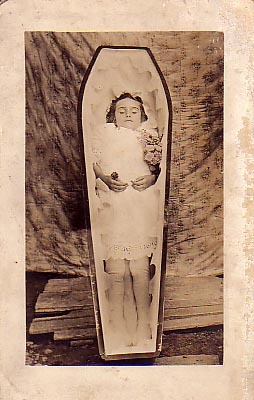 I interpret that the standing girl is supposed to be deceased and all I can gather as evidence is her hands are darker. However she's laced into a pretty tight corset... are they saying that killed her although it probably helped deform her internal organs eventually. This photo does the rounds on the Web each time you run a search and it's laughable. 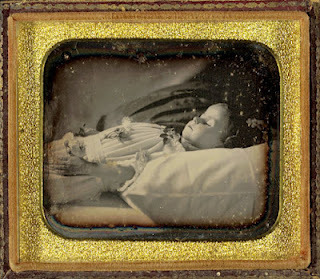 People want to see post mortem photos, and photo with age featuring a child has turned sensationalised into a phenomenon of dead kid pictures when half of them are not. Theyre just waiting for the exposure and losing the will to live... not necessarily done it yet. Use your common sense people. 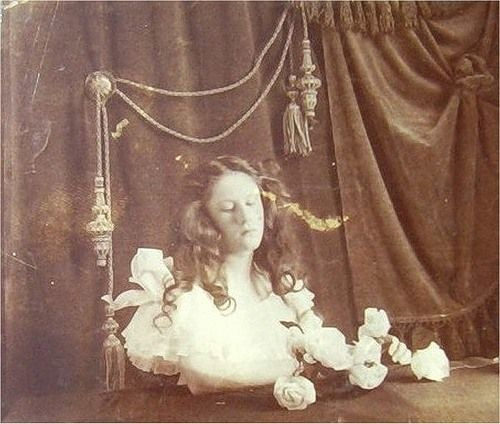 Not all victorian photos feature dead people. If they're standing up its a good inclination they're alive too! 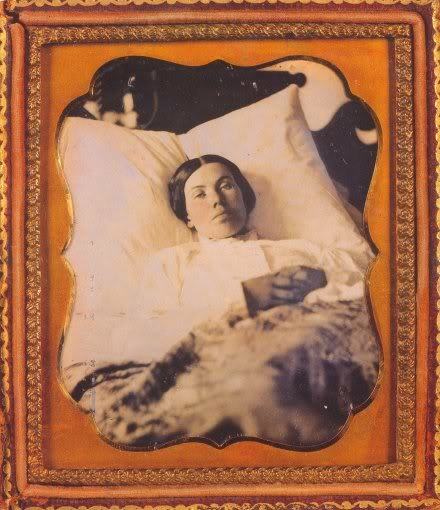 Many of these are NOT dead people. Some are merely sick or frail. were probably a comfort to the parents and friend of the deseased. 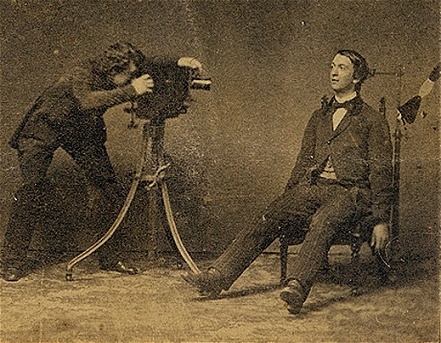 Stands were ONLY used to help hold the living still for long shutter exposures that could last up to 45 seconds. Posing stands could never hold up the weight of a corpse, especially since a corpse can not balance its weight on its feet. It’s head would drop and it would topple over. If you see a stand, they were alive. The Fireman. 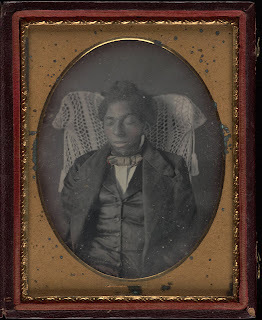 Yes, this man is dead. If you look closely, you can see the stand keeping him in an upright position behind his feet. As the son of a homicide detective, I've heard a great deal of how rigor mortise locks a person into the positing they died in, in a matter of hours. 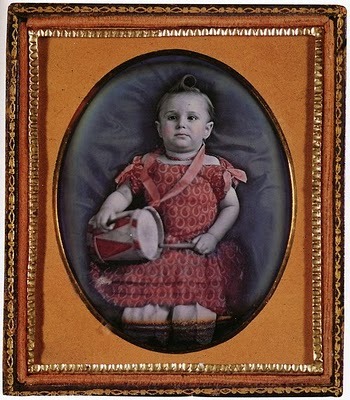 From this, I can only surmise that many of the posed photos must have been taken before rigor mortise set in, but I also see that a great number of these were taken professionally, as most families did not own and could not operate complicated photo equipment, that existed at that time. 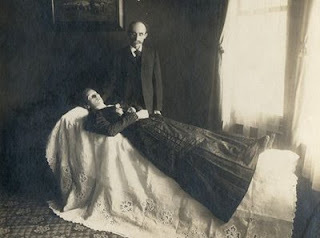 The point being that in less than 24 hour after death, a corpse is not a floppy rag doll that can just be positioned at will. 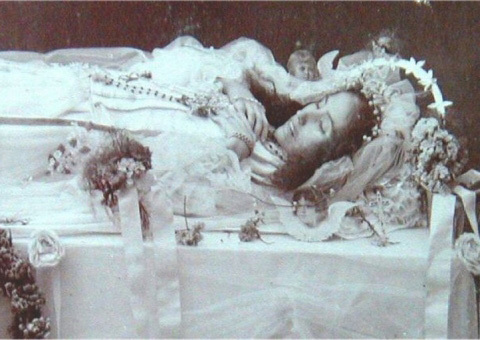 So, how did they manipulate these bodies, if they could not be photographed within hours of death? Steven, that is because those were live subjects. They are stiffly posed using a posing stand so that their movement does not ruin the photo that has a shutter speed of 30 to 45 seconds. 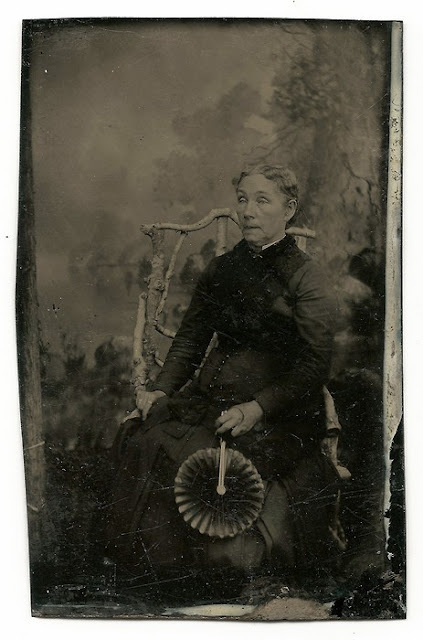 I have worked with period photographers. It was a horrifyingly morbid practice. I think it was criminal to make young children pose with their deceased sibling. How traumatizing it must have been. 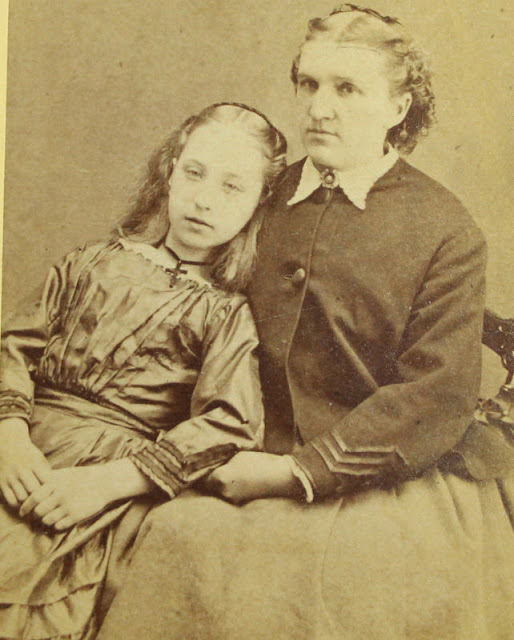 I saw one pic of a girl with her dead brother practically draped across her lap. The look on her face said it all. She was disturbed by the whole thing. Thats just your opinion. It was a different world. 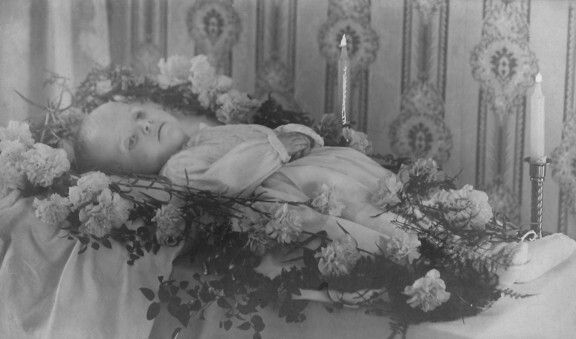 People died young and death was omnipresent. 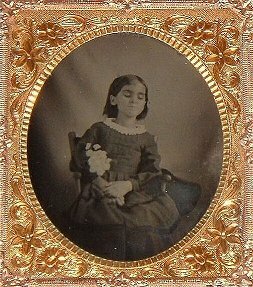 She was sad because her brother died. Try not to judge. You say that "anyone standing is alive" . 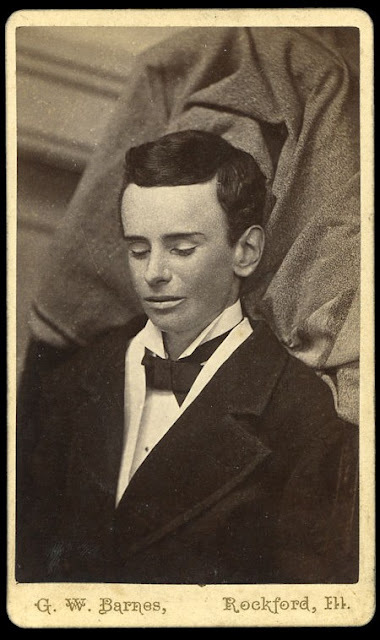 Yet, in this series of picture, there's what seems to be an ad for an undertaker, with a mention that the subject is dead, and he's standing. 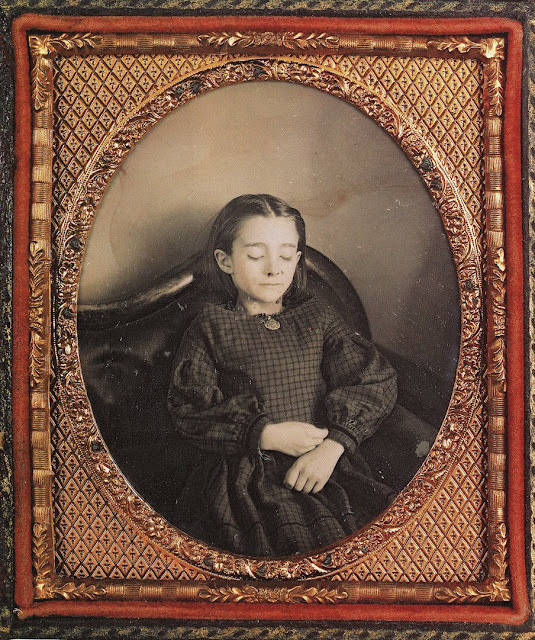 I'm sure that plenty of pictures labelled post-mortem are in fact of living people with an eerie look, but how could you affirm that none are? A lot of people on here are incredulous. Yes its weird by our stabdards that does not mean it wasnt possible. I don't know if I agree with u! Not everyone who is standing is alive. They were able to stand them up using a device they invented specifically for that purpose. How well the pics came out back then depended on your social standings n wealth. Back then if u had money n someone passed u got the best of the best, the cream of the crop pics done. 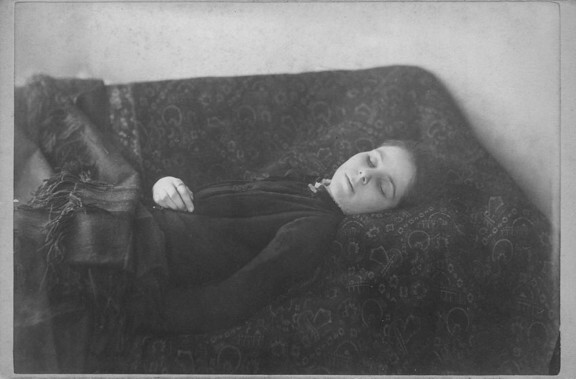 The pics were taken so well that you'd never think they r dead. They'd make sure every hair was in it's place, they'd work for hrs massaging the faces so they wouldn't show their faces of death. 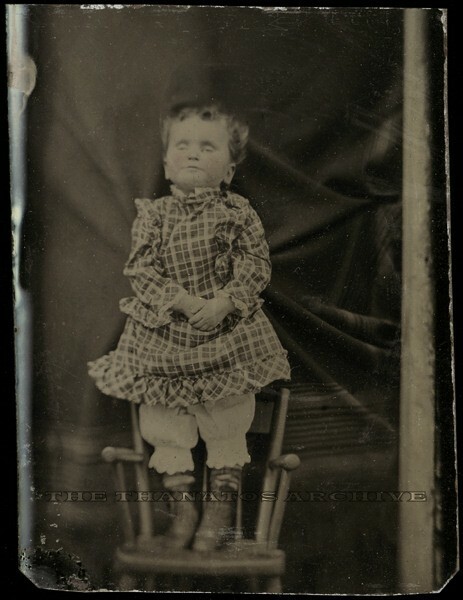 The eyes would be either sewed/glued open so u could see the deceased eyes. Their eyeballs would manually be moved (the best they could) to look like they were still very much alive!! I actually give the mortisioners props!!! Doing what they did back then, as well as they did it considering the bare minimum of tools to do the job. This may seem strange to us but death is a natural part of life, and these days it is such a taboo subject. Hello, I know this is gonna sound like a dumb question but did any of those pics have any names written on them saying their names or any kind of info about them??? When I came across your website I NEVER thought I was gonna see what I stumbled across this morning while visiting your website!!!! I'm still in utter SHOCK!!! 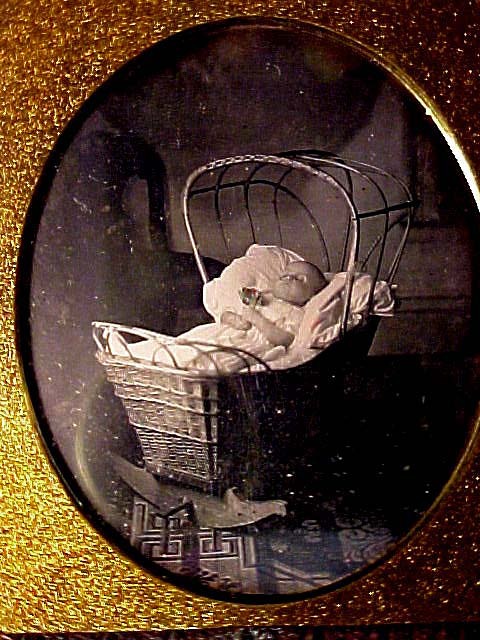 In one of the pics u have posted is a young woman looking down at her deceased baby while she's holding her baby in her lap. 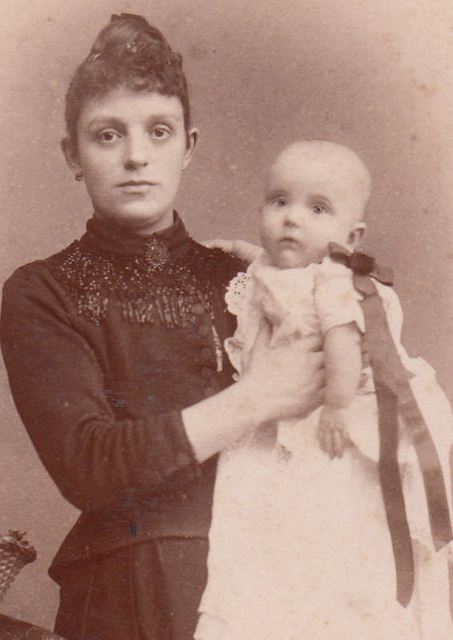 The young lady whom I'm guessing is the babies mother looks identical to my youngest daughter. When I say identical I mean identical to the point that if u were to put that dress on my daughter n do her hair the way it is in the pic it could actually be her. I can see them looking similar, I can see that happening but this is soooo much more than similar, it's identical, they could pass as identical twins!!!! 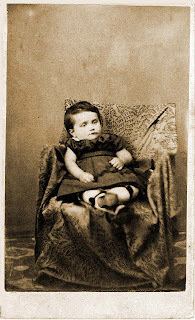 Literally she could be my daughter's twin born in the 1890's!!! I would love anyone who would like to see how eeriely identical they look to message me, I would love to email or message the pic n get your opinion!!!! My email is ninaking0217@gmai.com if youdd like to see the pic I'm referring to!!! 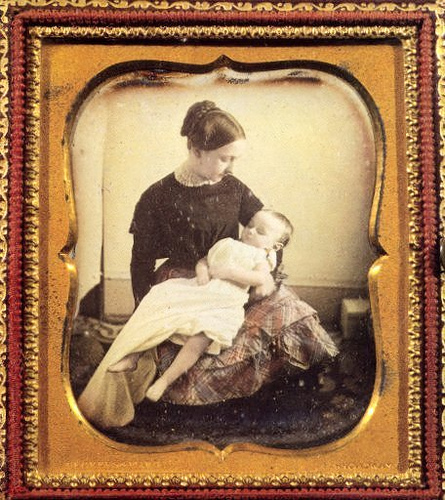 Posthumous photography was prevalent in our American history and still is carried on today to some degree. 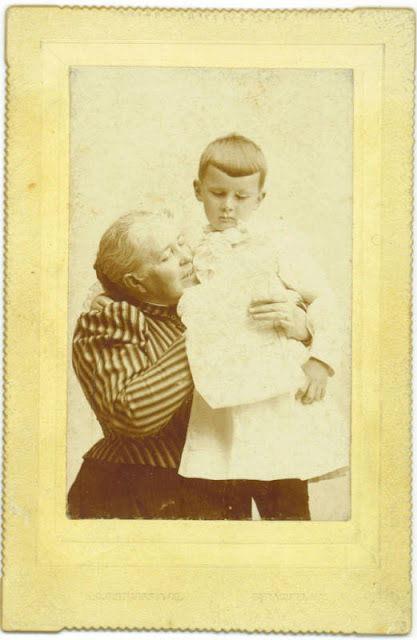 For the family history specialist it very well may be an important apparatus to find a passing photograph of a progenitor as this might be the main photograph that exists. I find a very good website for the towing , If you want you can visit this site. Lots of different opinions here. I agree that some of the pics are hard to see but I think it's good for all of us to remember to respect others opinions. 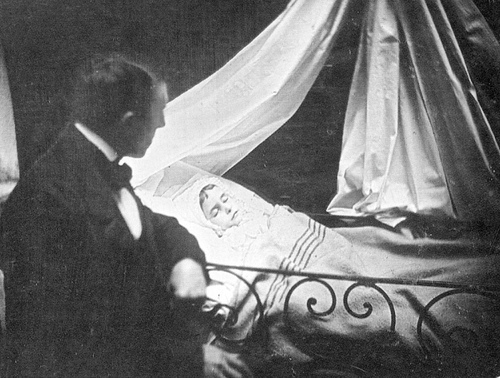 Would they have been able to get the deceased to “stare” at the camera? I can tell which people with eyes open are dead if it looks like they’re “staring” at nothing or the eyes are pretty much rolled into their heads but not sure about the ones looking at the camera! There’s this one of an adult man I’ve seen a few times but his eyes have that cloudy look a dead persons eyes would, but he’s staring directly at camera and kind of mad! Wish I could find him again somewhere to see if he’s actually dead cuz if he is it’s probably the creepiest of them all!